This In-house course was developed to meet the needs of SAP R/3 Consultants working at Capgemini. 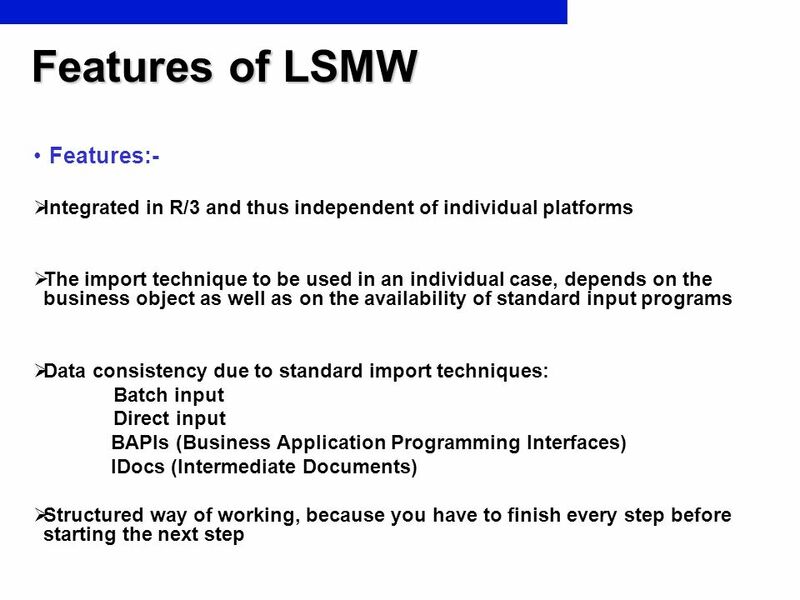 This course is designed to present a high level view of LSMW and to provide the Consultants with information about how to use this Functionality. Your comments at the conclusion of this training session are appreciated and will help us better tailor future courses to meet your training needs. 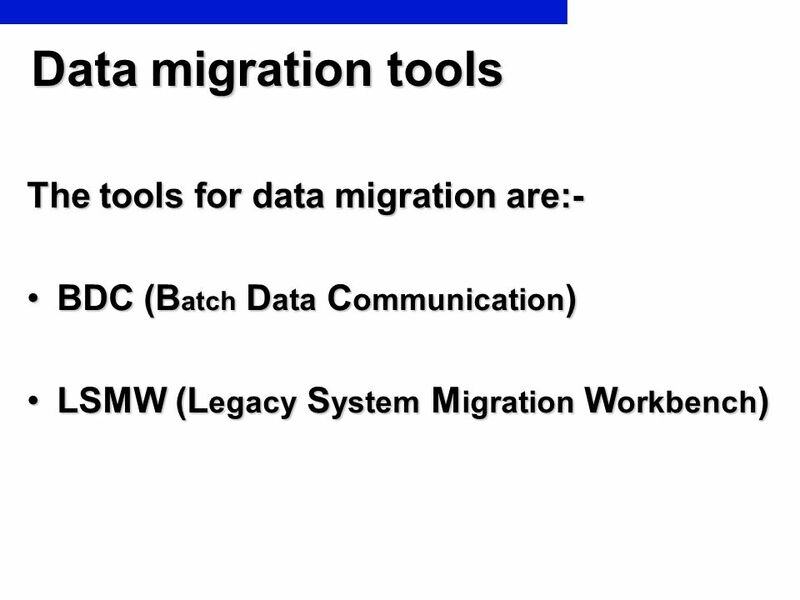 Data migration comes in the end of R/ implementation. 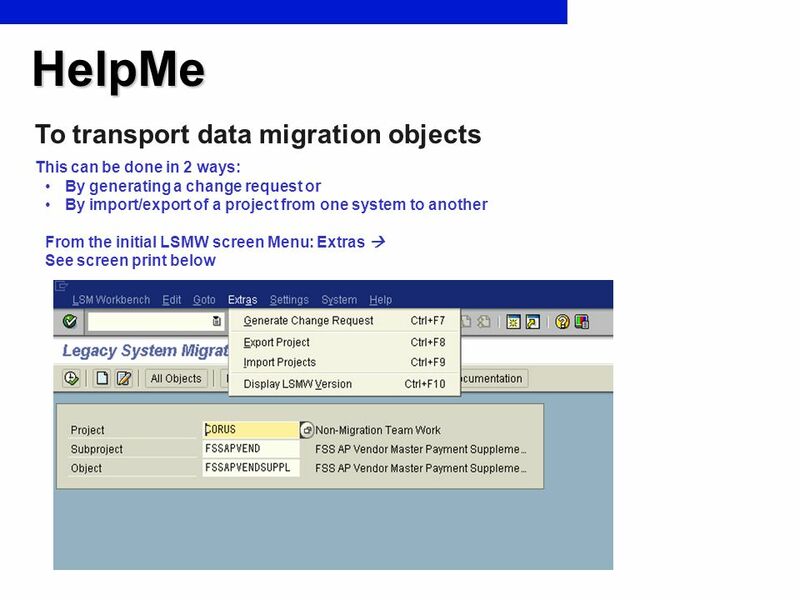 To start with Data Migration first configuration should be fully completed Data migration is about 20% to 40% of the total implementation expenses. 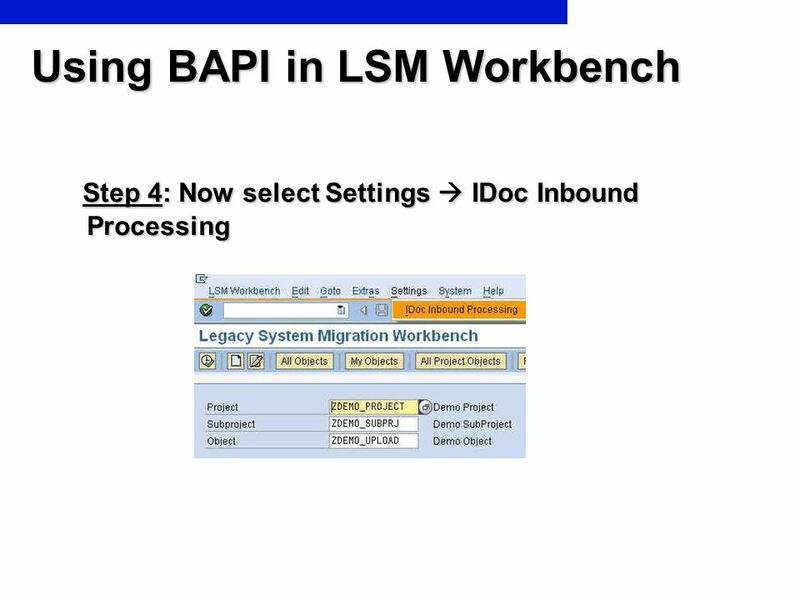 LSMW offers different technique for migrating data: Direct input, BAPI, Idoc, Batch input recording. 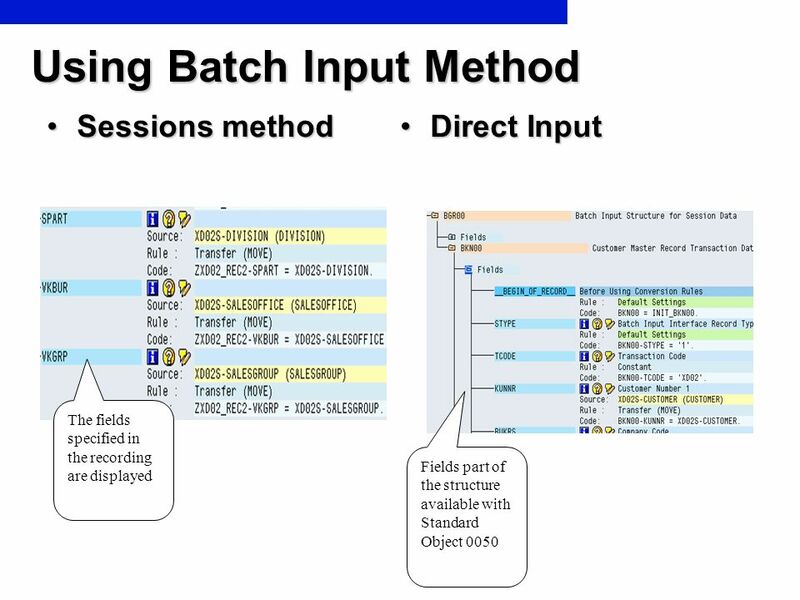 While BDC basically uses batch input sessions and CALL TRANSACTION method. 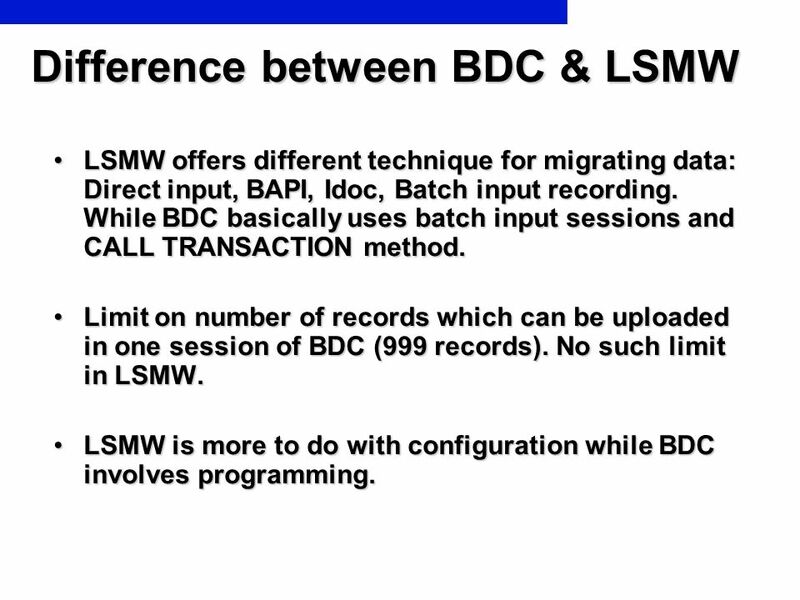 Limit on number of records which can be uploaded in one session of BDC (999 records). No such limit in LSMW. 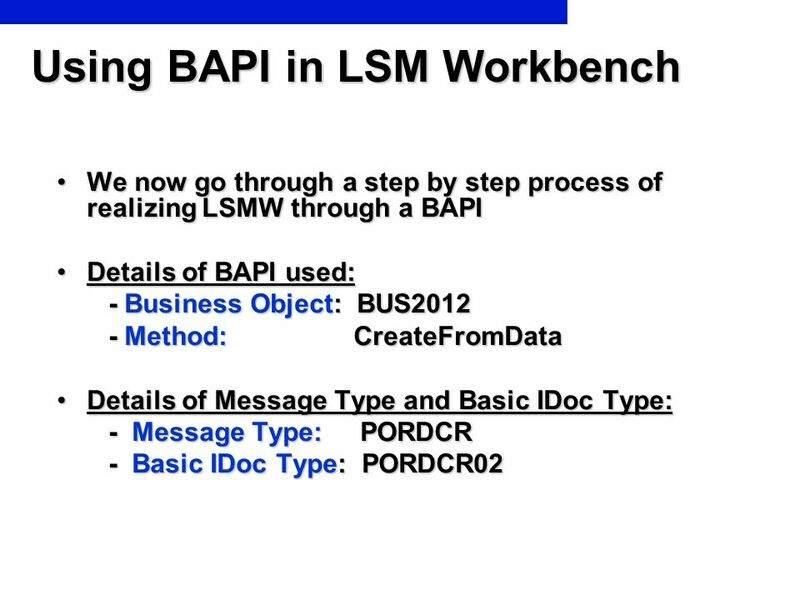 LSMW is more to do with configuration while BDC involves programming. 9 What is LSMW? 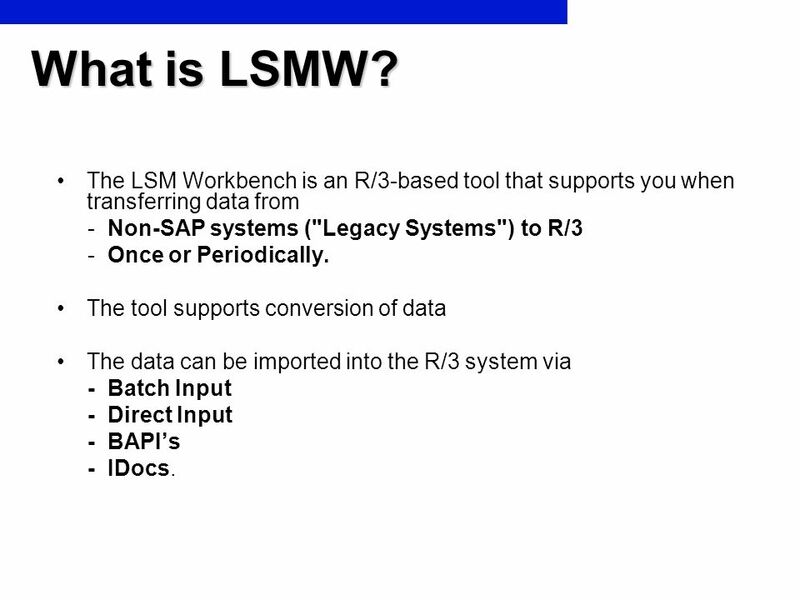 The LSM Workbench is an R/3-based tool that supports you when transferring data from - Non-SAP systems ("Legacy Systems") to R/3 - Once or Periodically. 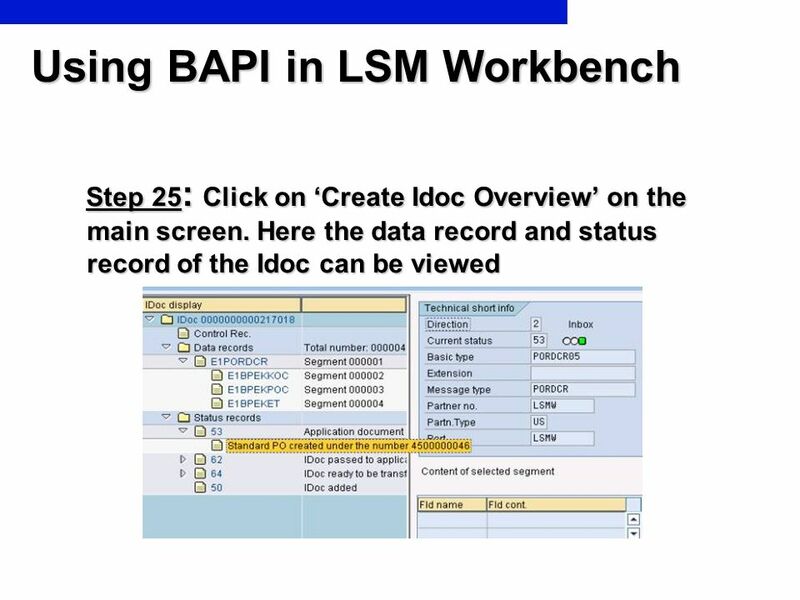 The tool supports conversion of data The data can be imported into the R/3 system via - Batch Input - Direct Input - BAPI’s - IDocs. 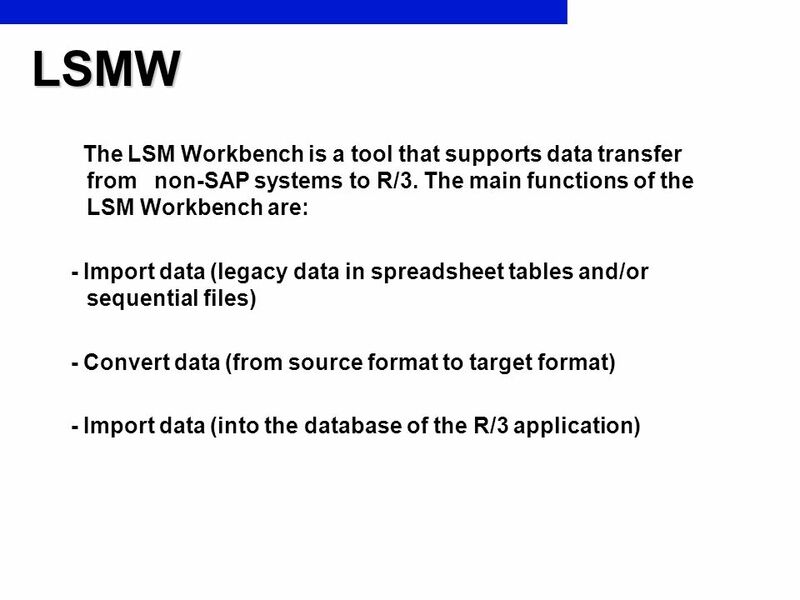 Basic Principles of LSM workbench:- Most of the functions should reside in R/3. No collection of individual programs on different platforms. 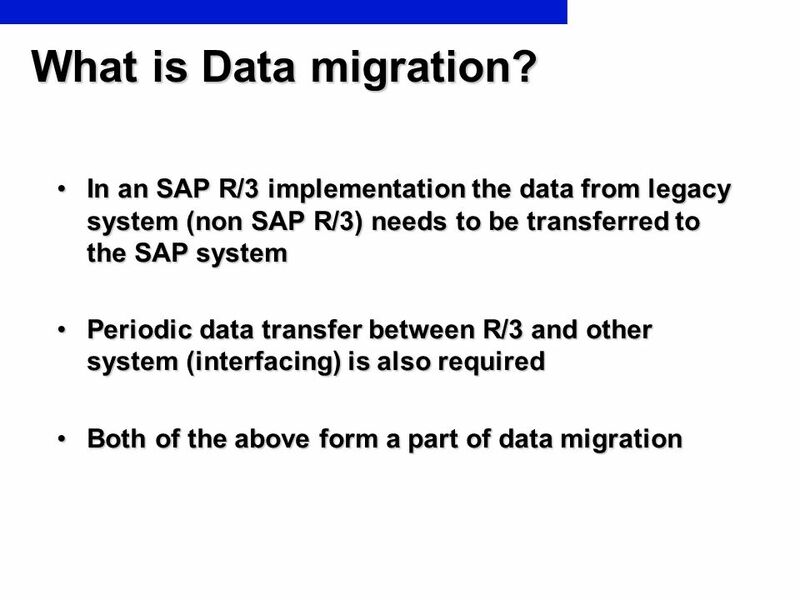 The quality and consistence of the data imported into R/3 should be more important than speed and performance of data migration. 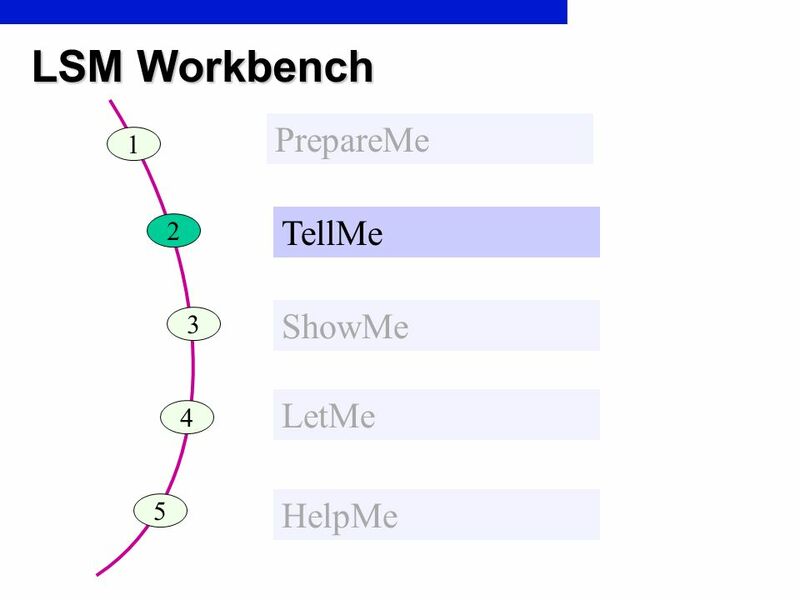 Existing knowledge and coding should be used. 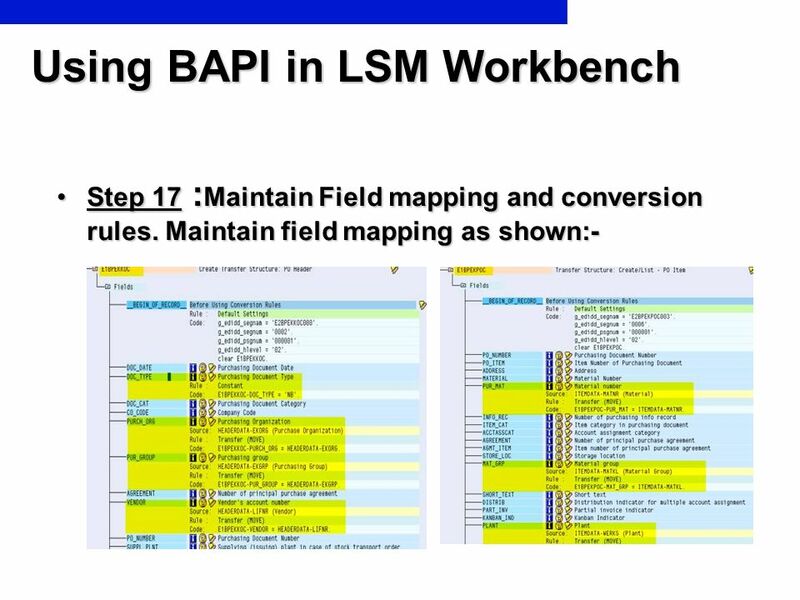 The developed ”mapping" and rules should be reusable and thus be used repeatedly in projects. 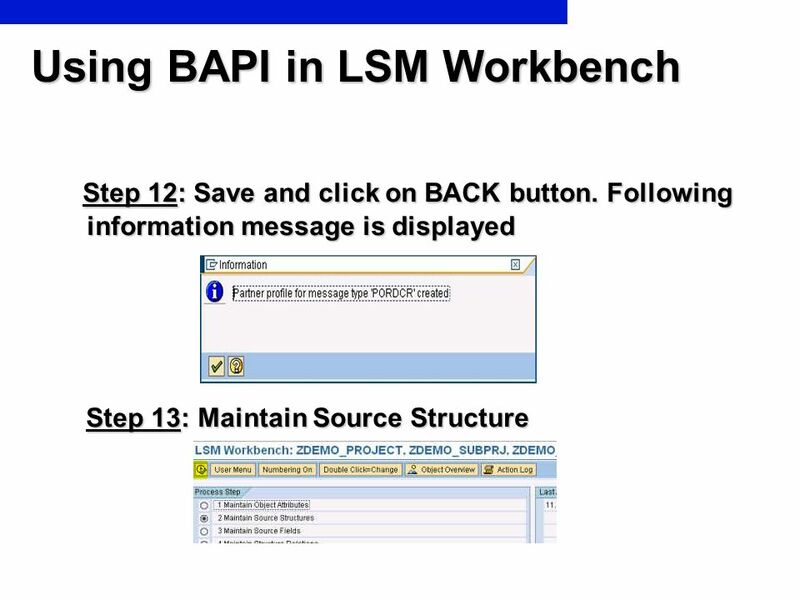 Make sure that SAP customizing is finished. 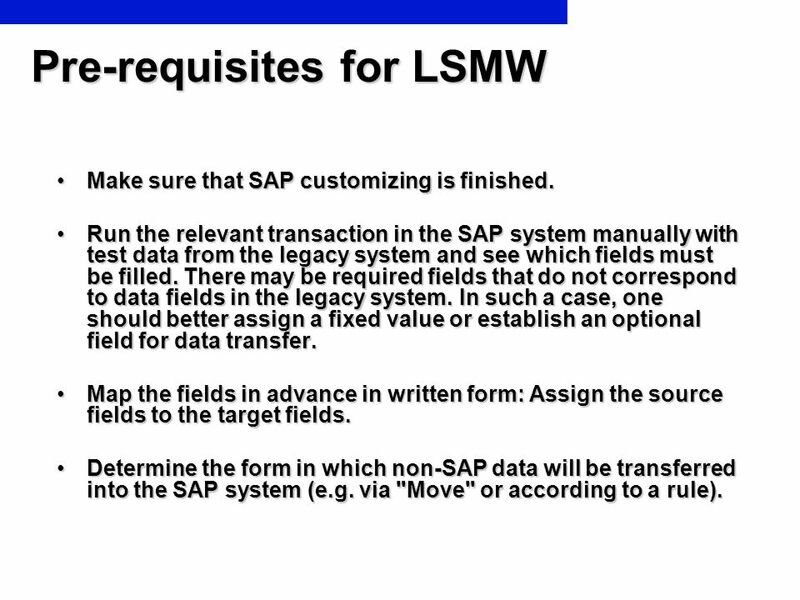 Run the relevant transaction in the SAP system manually with test data from the legacy system and see which fields must be filled. 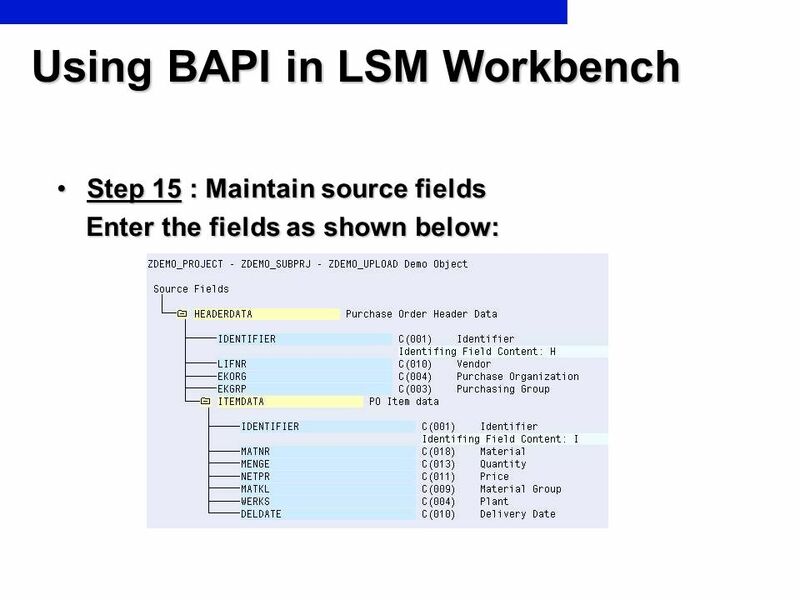 There may be required fields that do not correspond to data fields in the legacy system. 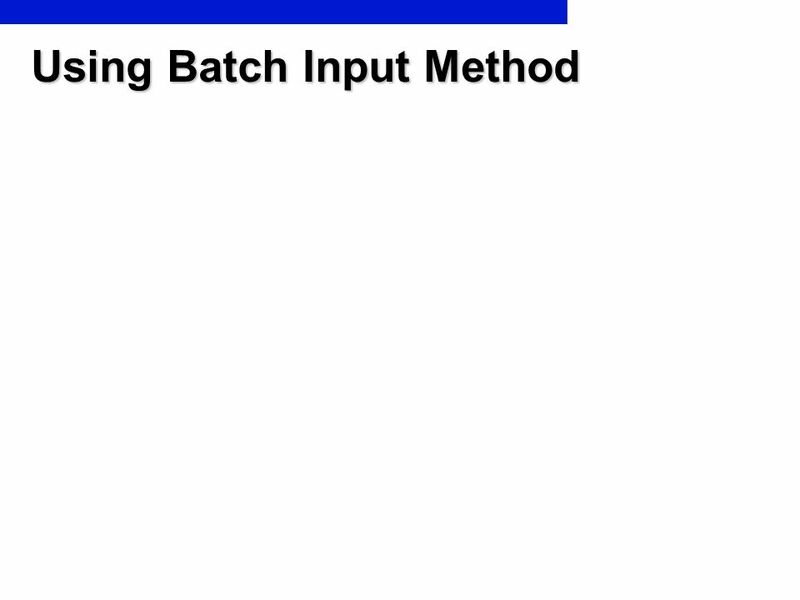 In such a case, one should better assign a fixed value or establish an optional field for data transfer. 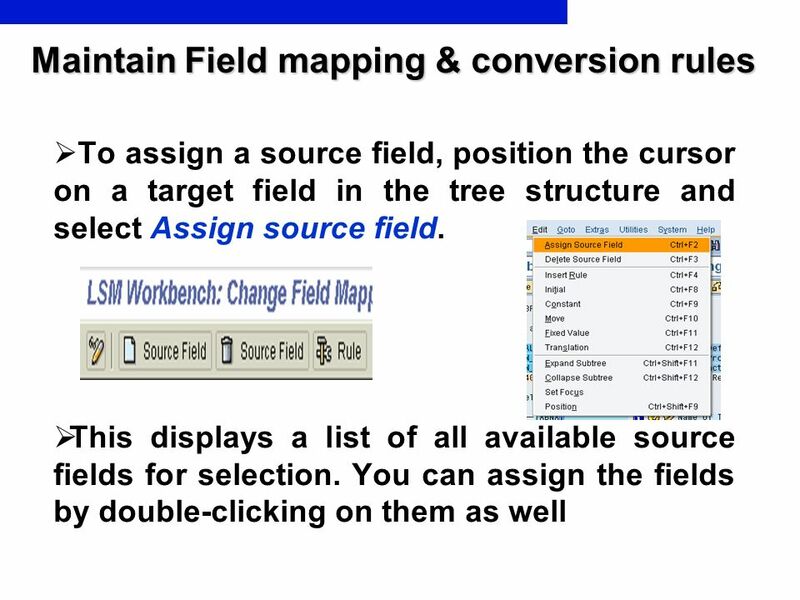 Map the fields in advance in written form: Assign the source fields to the target fields. Determine the form in which non-SAP data will be transferred into the SAP system (e.g. via "Move" or according to a rule). Advantages: Well tested method, Fast to load, easy processing. 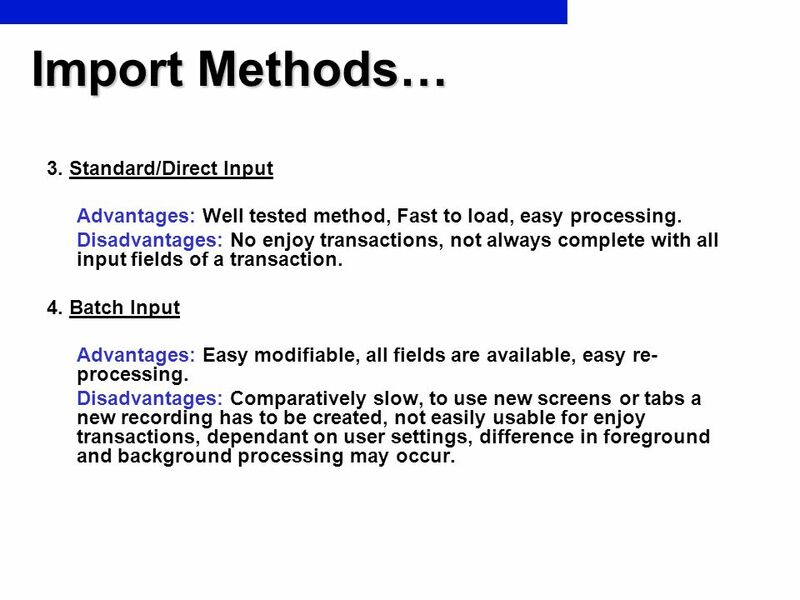 Disadvantages: No enjoy transactions, not always complete with all input fields of a transaction. 4. 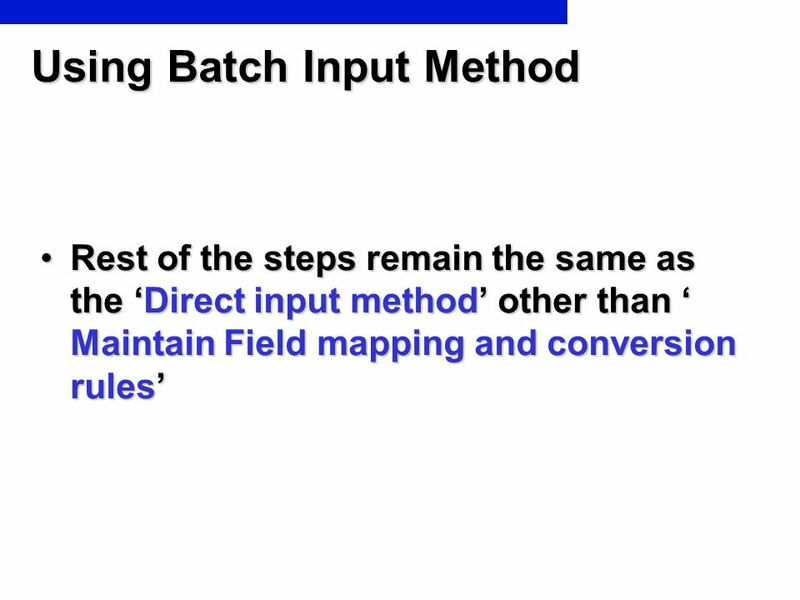 Batch Input Advantages: Easy modifiable, all fields are available, easy re-processing. Disadvantages: Comparatively slow, to use new screens or tabs a new recording has to be created, not easily usable for enjoy transactions, dependant on user settings, difference in foreground and background processing may occur. 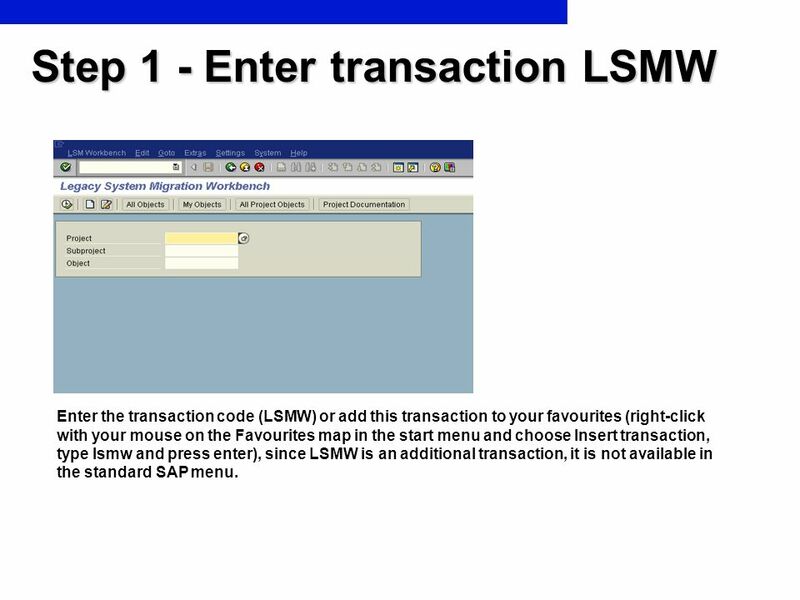 Enter the transaction code (LSMW) or add this transaction to your favourites (right-click with your mouse on the Favourites map in the start menu and choose Insert transaction, type lsmw and press enter), since LSMW is an additional transaction, it is not available in the standard SAP menu. 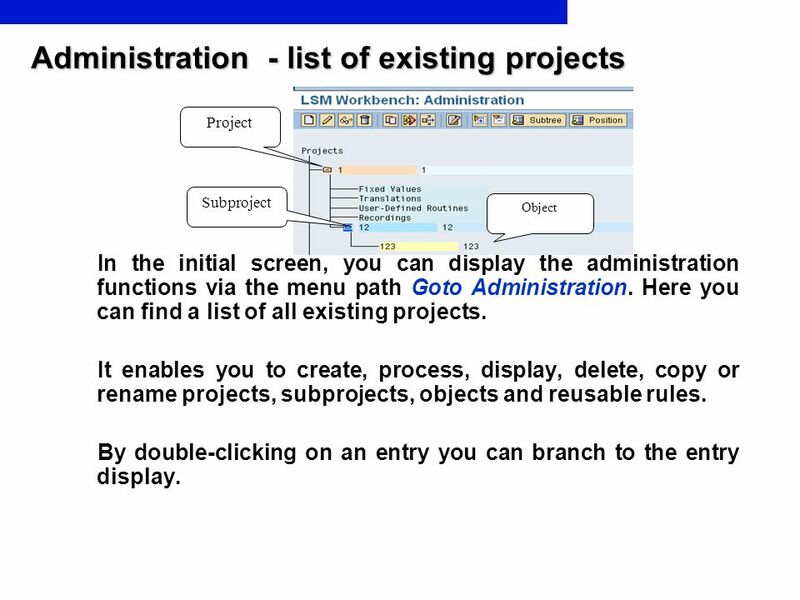 21 Step2 contd.. - At the initial screen, ‘All Objects’ provides a list of all projects created already. - ‘My Objects’ displays a list of all objects you created personally - ‘All Project Objects’ displays all objects of the selected project as tree structure. 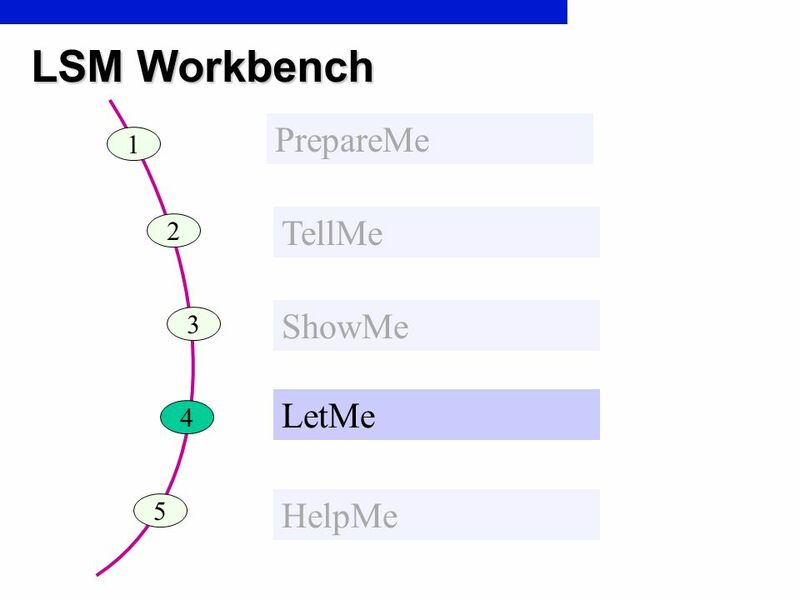 - ‘Project Documentation’ displays any documentation written for the individual pop-ups and processing steps. 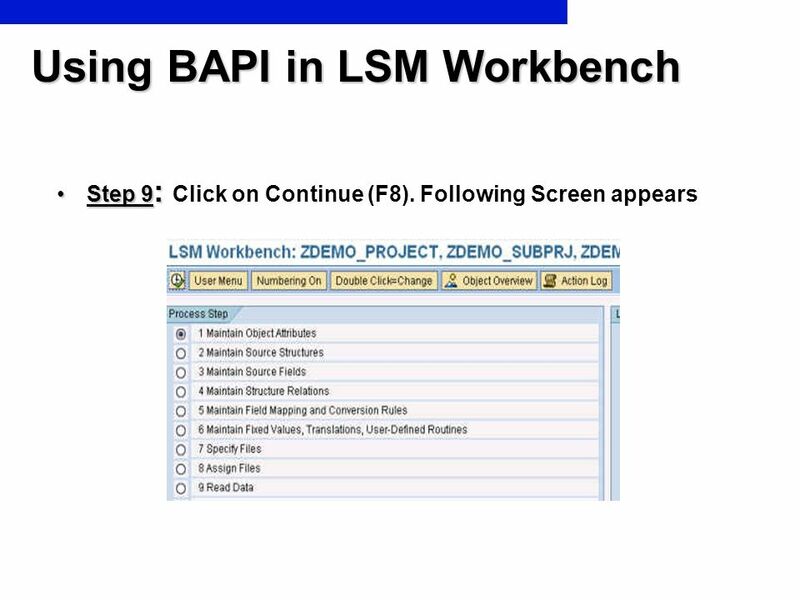 You can print the project documentation out, send it and save it in various file formats. - Select ‘Documentation’ to enter your notes. After clicking, a popup is displayed in which you can write down your personal documentation. 22 Initial Screen By clicking the button execute or pressing the F8 key on your keyboard you go to the object, you selected. 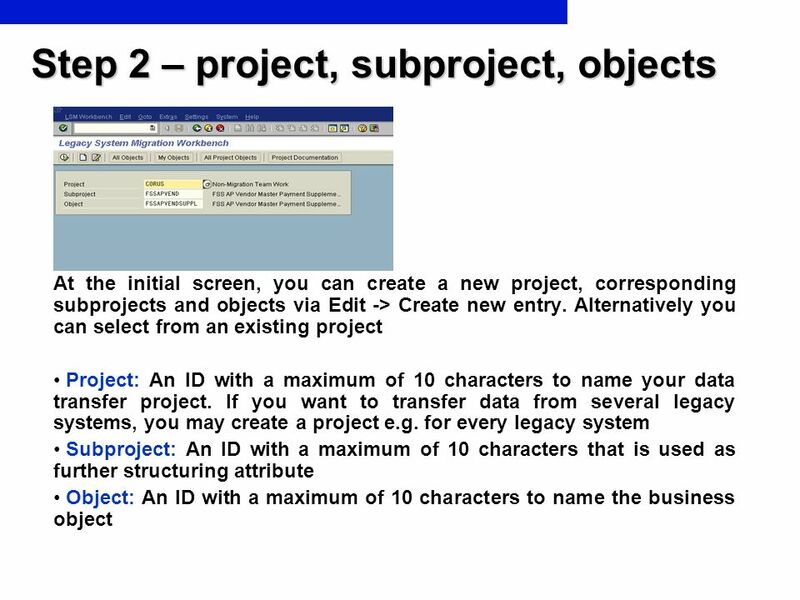 By clicking the button create a new object for the selected project and subproject with the name entered in the object field is created. 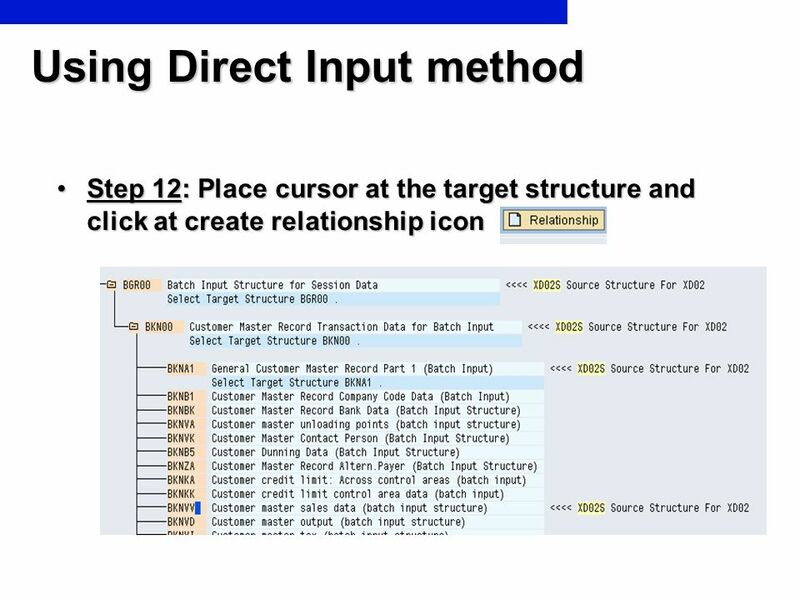 By positioning the cursor on an entry and clicking on the button documentation, you can add change or delete comments. 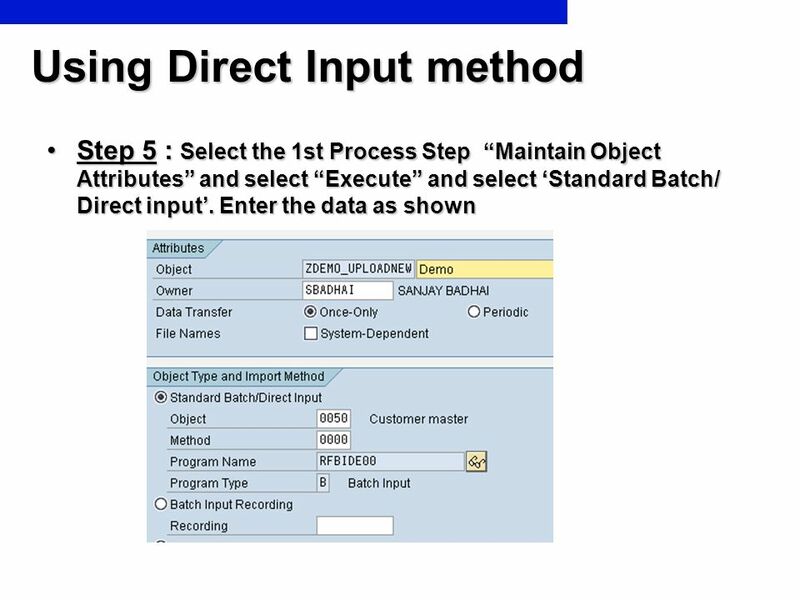 Choose if the data transfer is once or periodic If Batch input recording is selected one can enter further recordings by clicking at the arrow Choose method for input of data. 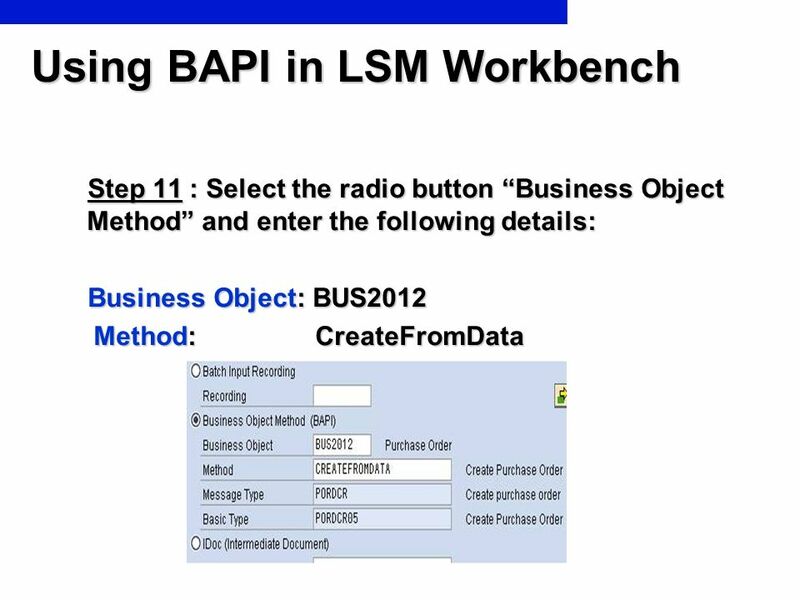 In the method to input data from a BAPI, one needs to select the Business Object and the corresponding method. 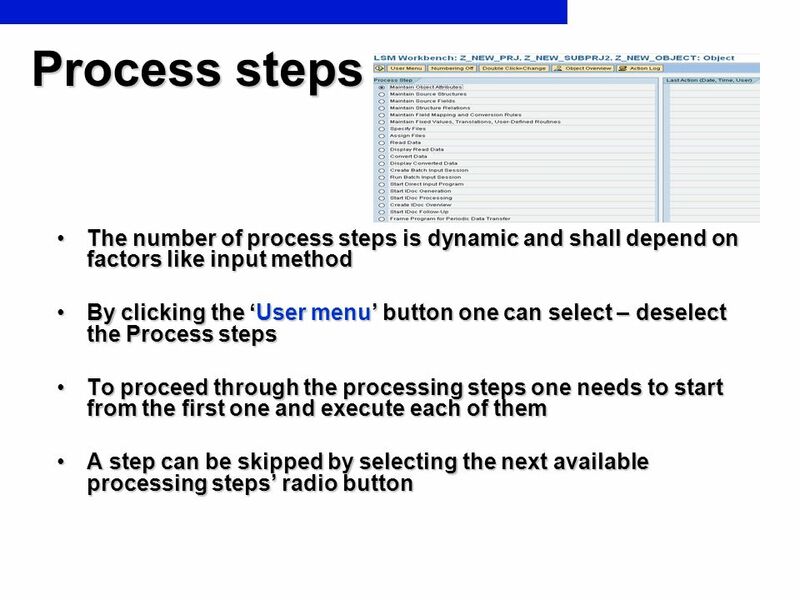 User Menu: Here you can make an individual selection from the displayed processing steps. 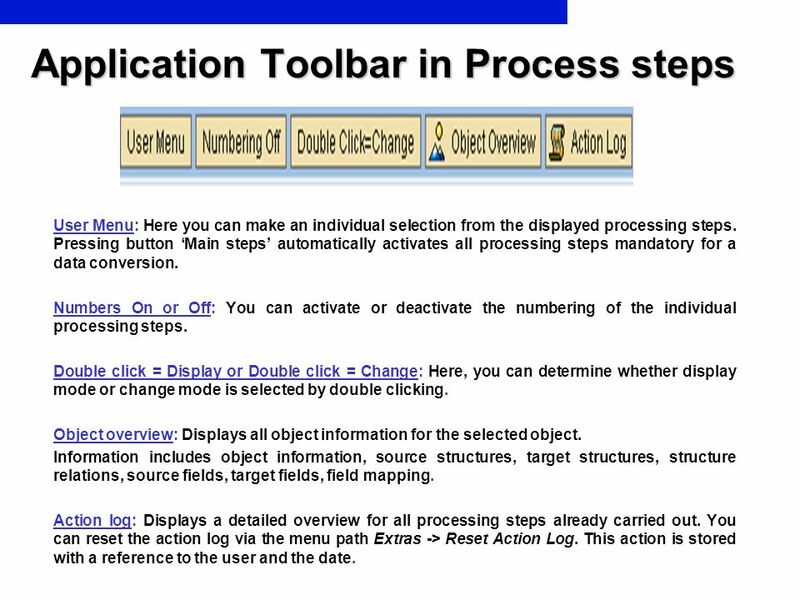 Pressing button ‘Main steps’ automatically activates all processing steps mandatory for a data conversion. 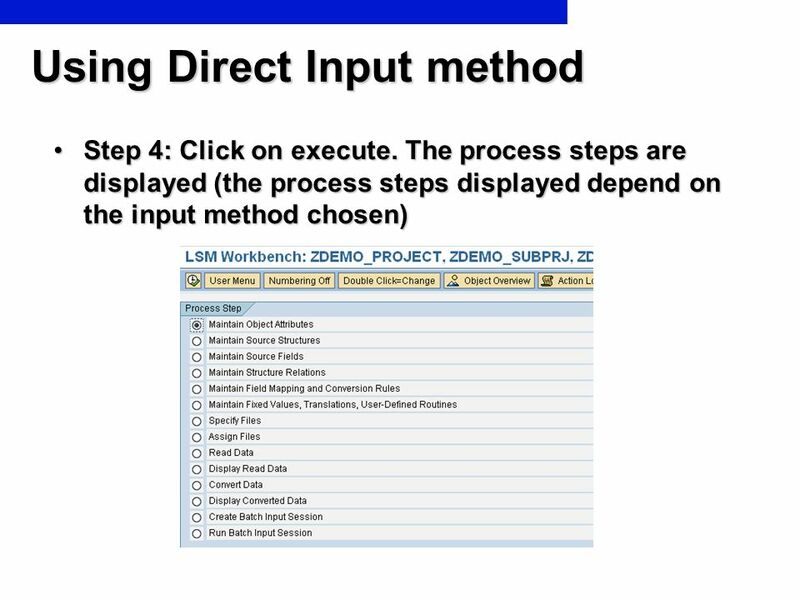 Numbers On or Off: You can activate or deactivate the numbering of the individual processing steps. Double click = Display or Double click = Change: Here, you can determine whether display mode or change mode is selected by double clicking. 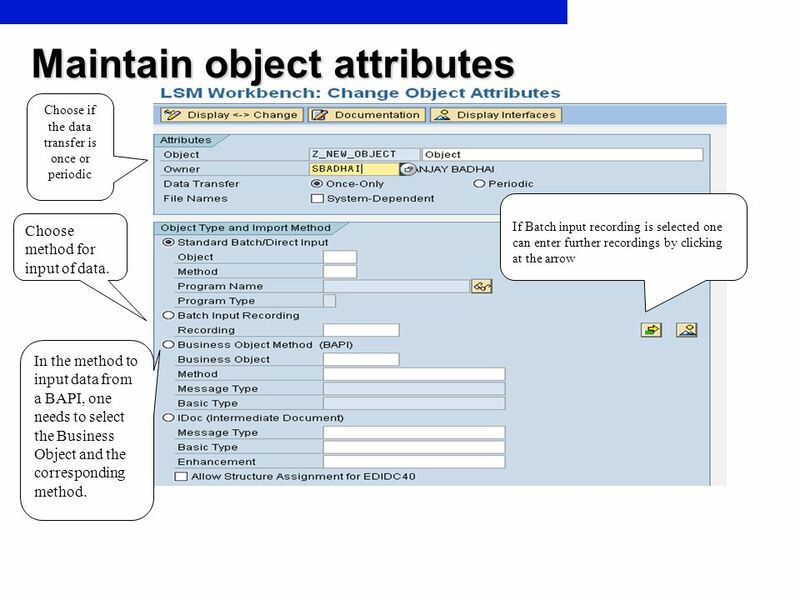 Object overview: Displays all object information for the selected object. 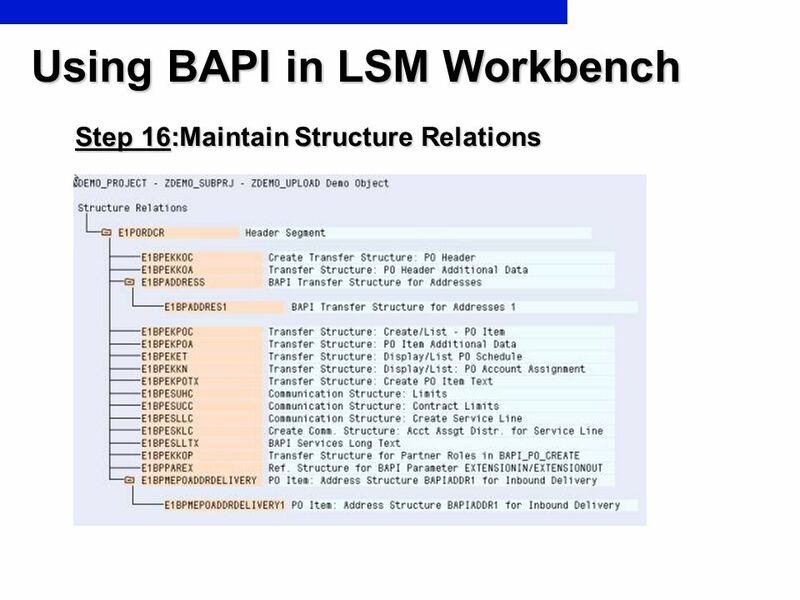 Information includes object information, source structures, target structures, structure relations, source fields, target fields, field mapping. 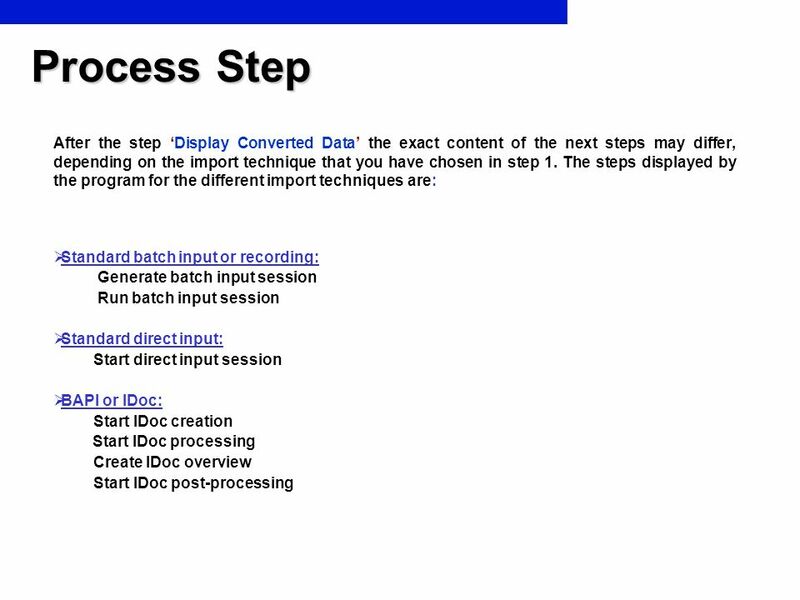 Action log: Displays a detailed overview for all processing steps already carried out. You can reset the action log via the menu path Extras -> Reset Action Log. 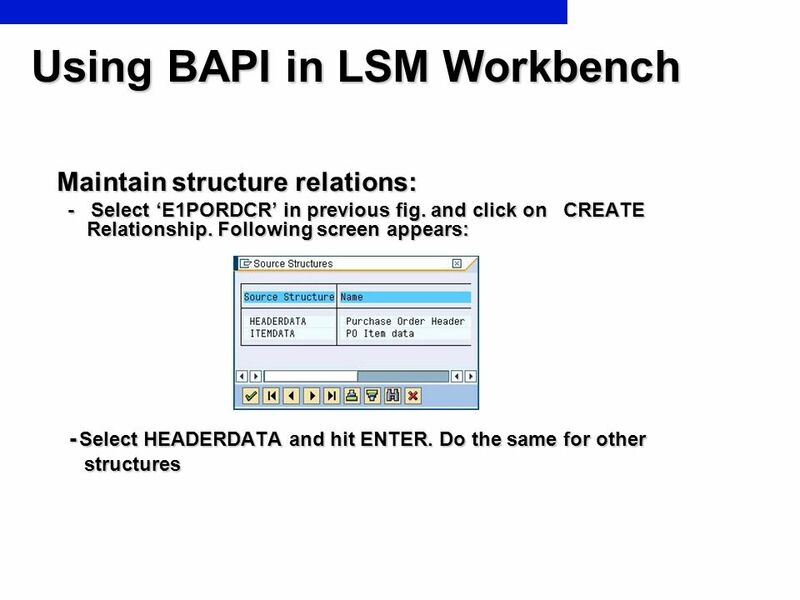 This action is stored with a reference to the user and the date. 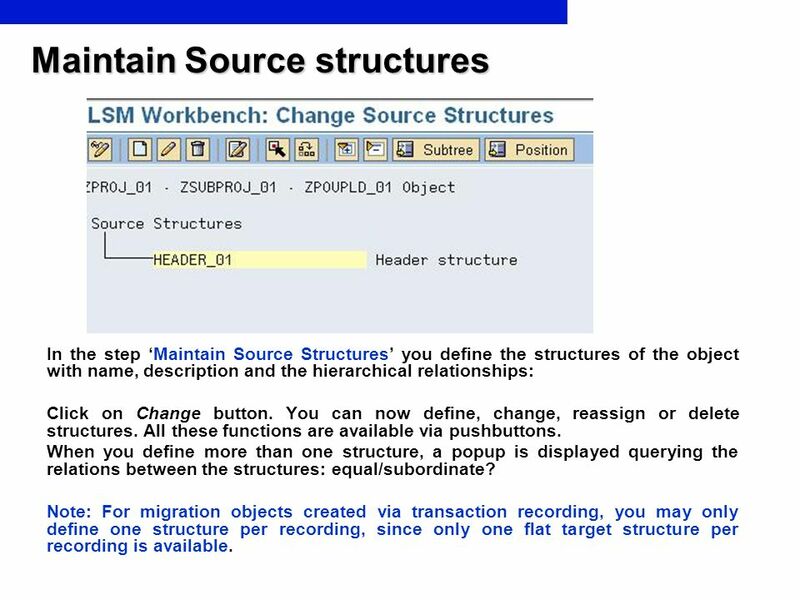 In the step ‘Maintain Source Structures’ you define the structures of the object with name, description and the hierarchical relationships: Click on Change button. 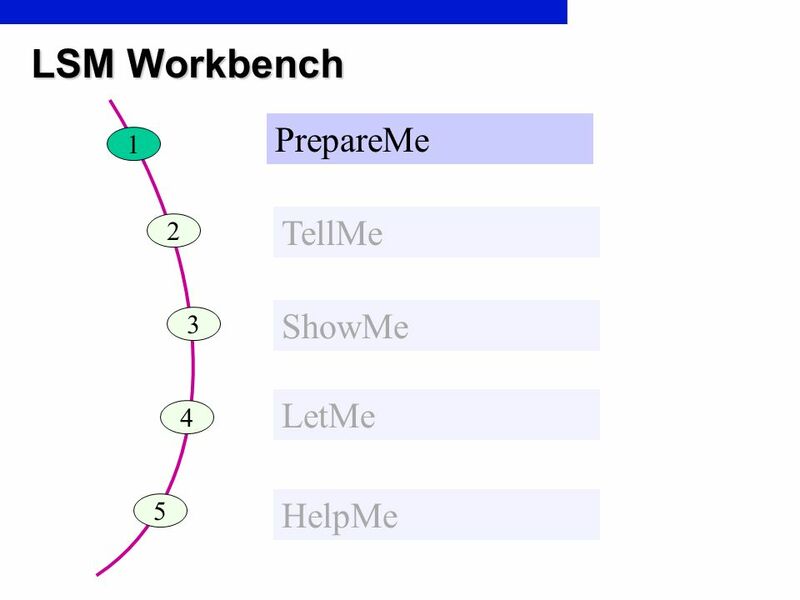 You can now define, change, reassign or delete structures. 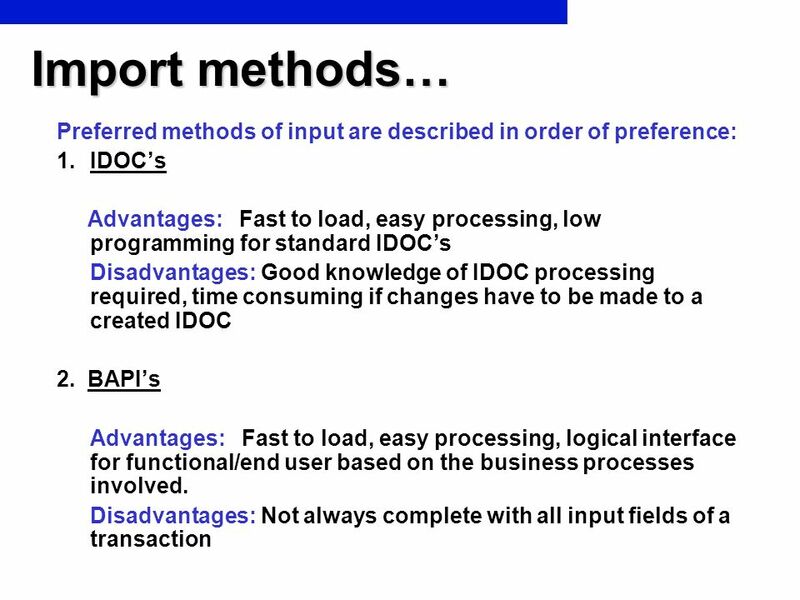 All these functions are available via pushbuttons. When you define more than one structure, a popup is displayed querying the relations between the structures: equal/subordinate? 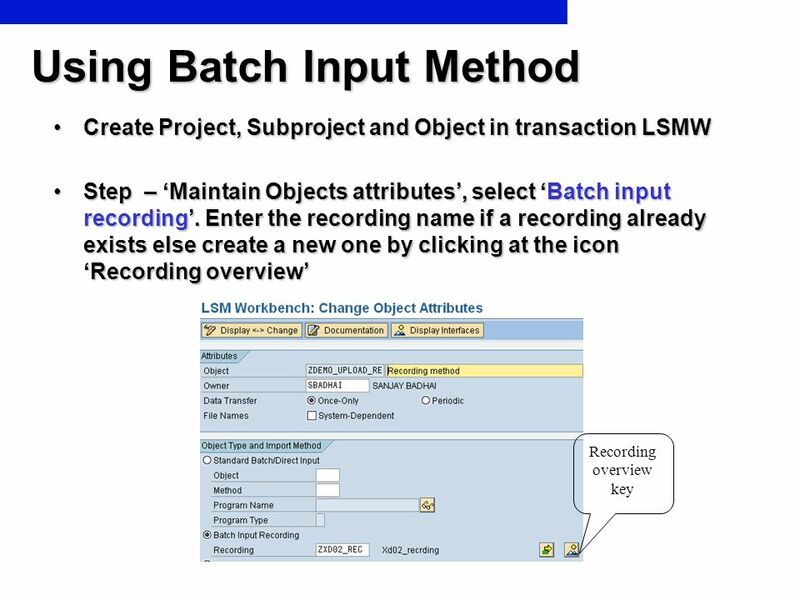 Note: For migration objects created via transaction recording, you may only define one structure per recording, since only one flat target structure per recording is available. 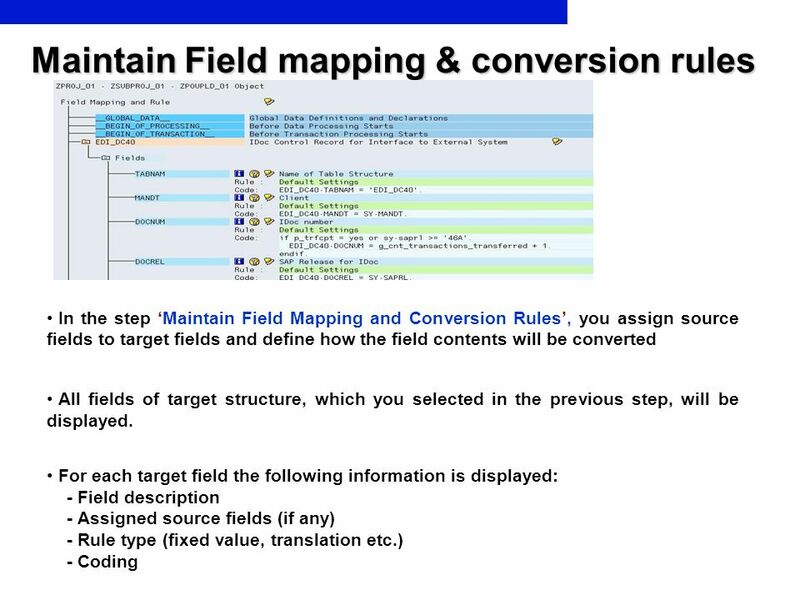 In the step ‘Maintain Source Fields’, fields are created and maintained for the source structure defined in the preceding step Use source fieldnames with the same names as the target fieldnames as much as possible, because it allows you to use the ‘auto-field mapping’ function in step 5 ‘Maintain field mapping and conversion rules’. 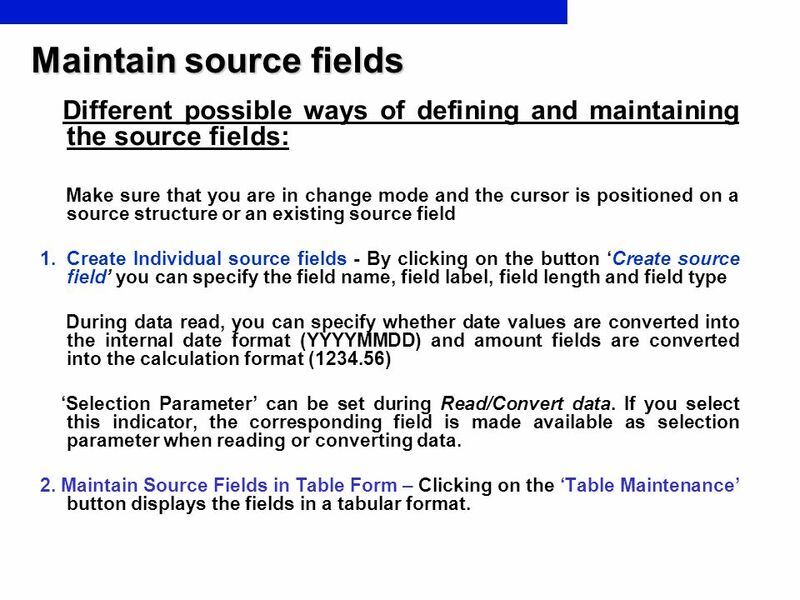 Different possible ways of defining and maintaining the source fields: Make sure that you are in change mode and the cursor is positioned on a source structure or an existing source field Create Individual source fields - By clicking on the button ‘Create source field’ you can specify the field name, field label, field length and field type During data read, you can specify whether date values are converted into the internal date format (YYYYMMDD) and amount fields are converted into the calculation format ( ) ‘Selection Parameter’ can be set during Read/Convert data. 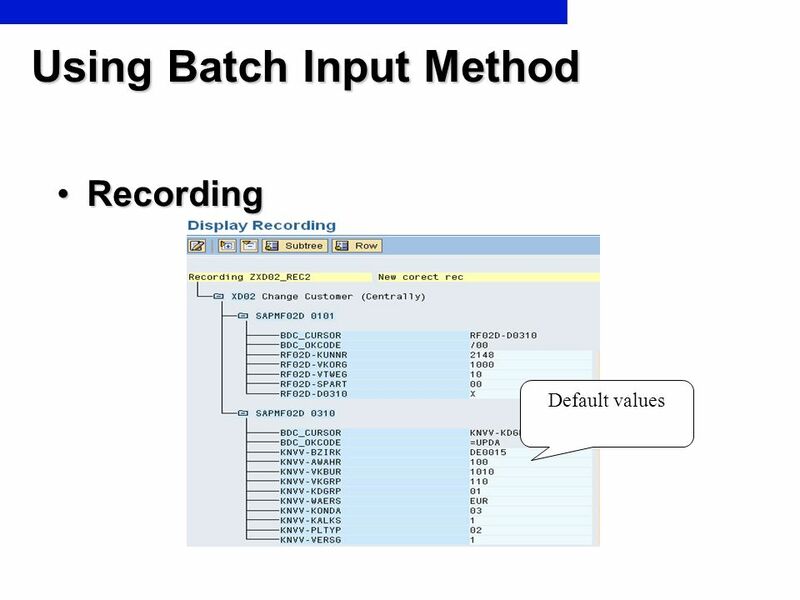 If you select this indicator, the corresponding field is made available as selection parameter when reading or converting data. 2. 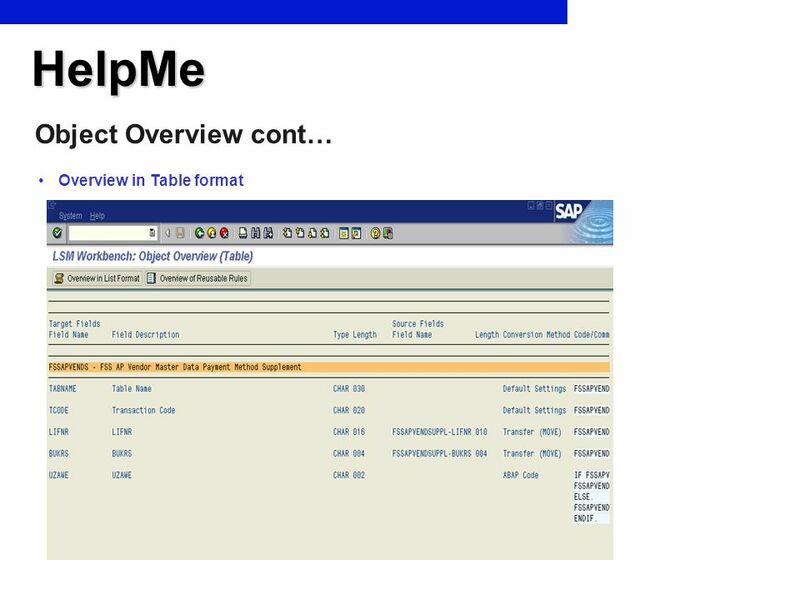 Maintain Source Fields in Table Form – Clicking on the ‘Table Maintenance’ button displays the fields in a tabular format. 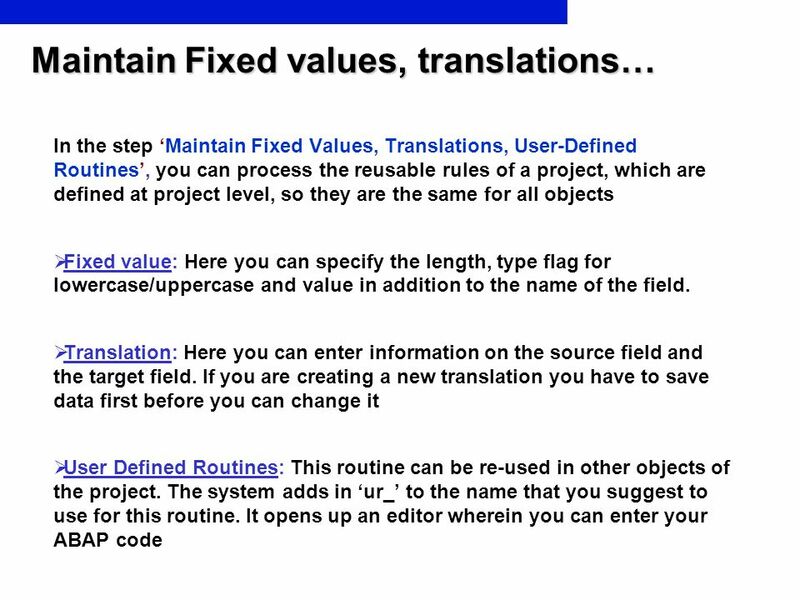 Different possible ways of defining and maintaining the source fields: 3. 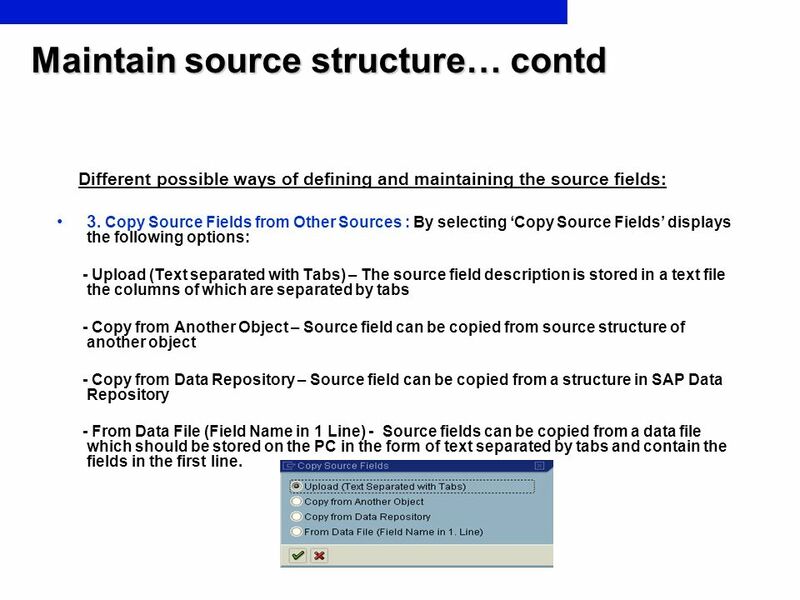 Copy Source Fields from Other Sources : By selecting ‘Copy Source Fields’ displays the following options: - Upload (Text separated with Tabs) – The source field description is stored in a text file the columns of which are separated by tabs - Copy from Another Object – Source field can be copied from source structure of another object - Copy from Data Repository – Source field can be copied from a structure in SAP Data Repository - From Data File (Field Name in 1 Line) - Source fields can be copied from a data file which should be stored on the PC in the form of text separated by tabs and contain the fields in the first line. 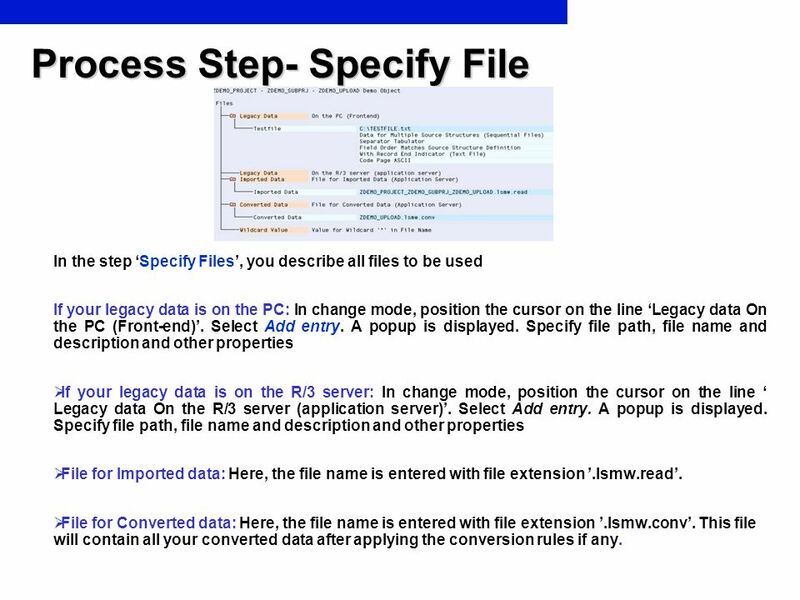 In the step ‘Specify Files’, you describe all files to be used If your legacy data is on the PC: In change mode, position the cursor on the line ‘Legacy data On the PC (Front-end)’. 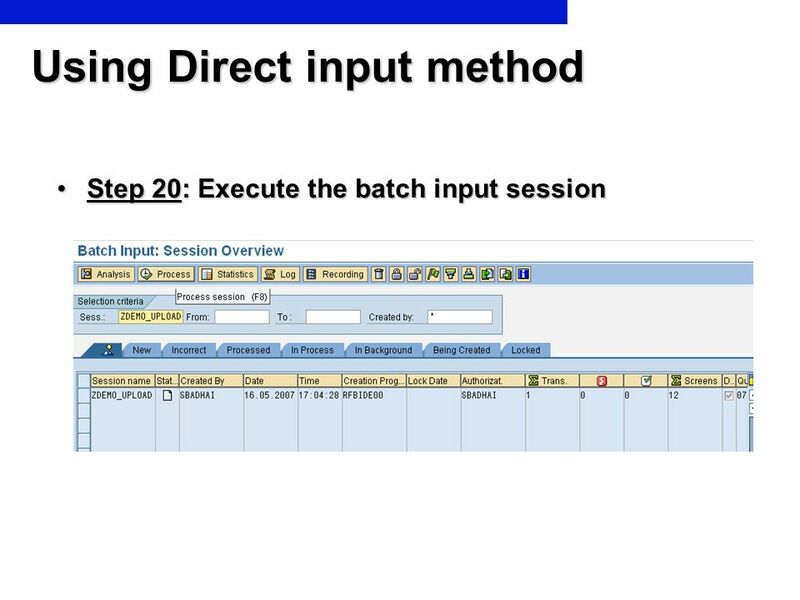 Select Add entry. A popup is displayed. 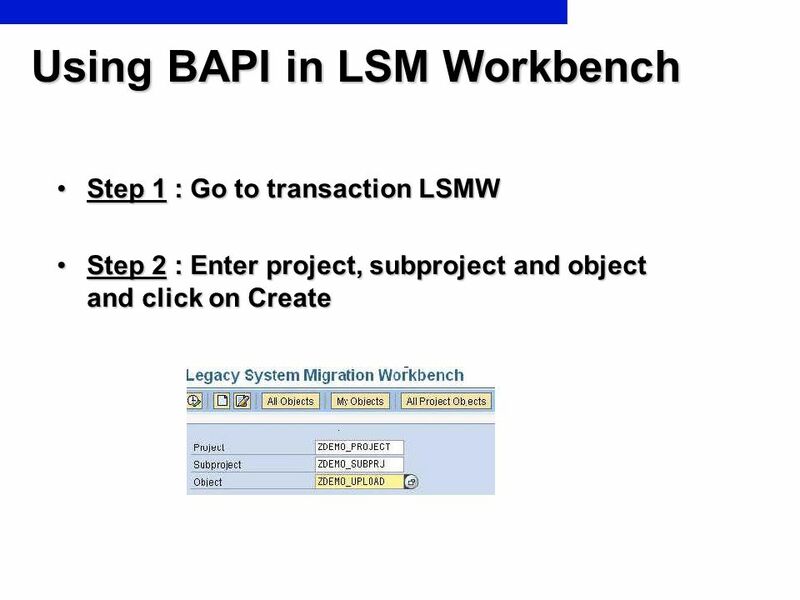 Specify file path, file name and description and other properties If your legacy data is on the R/3 server: In change mode, position the cursor on the line ‘ Legacy data On the R/3 server (application server)’. Select Add entry. A popup is displayed. 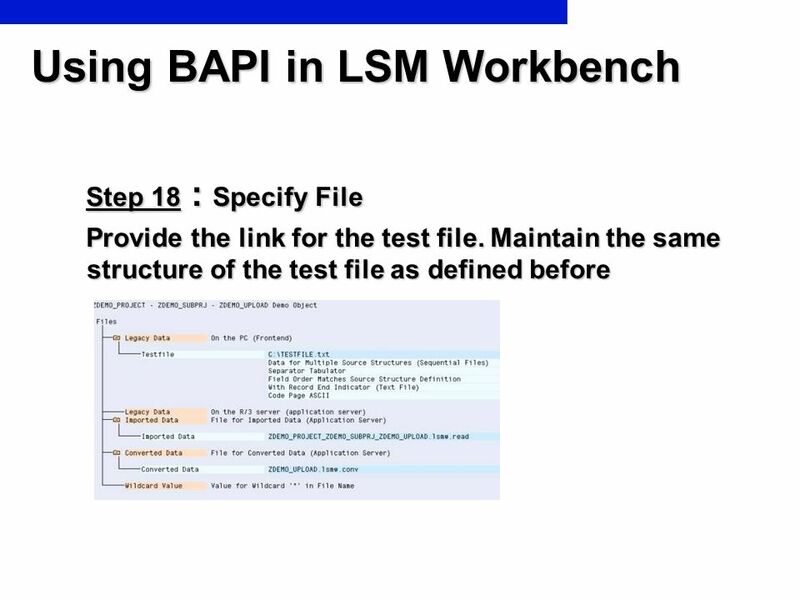 Specify file path, file name and description and other properties File for Imported data: Here, the file name is entered with file extension ’.lsmw.read’. 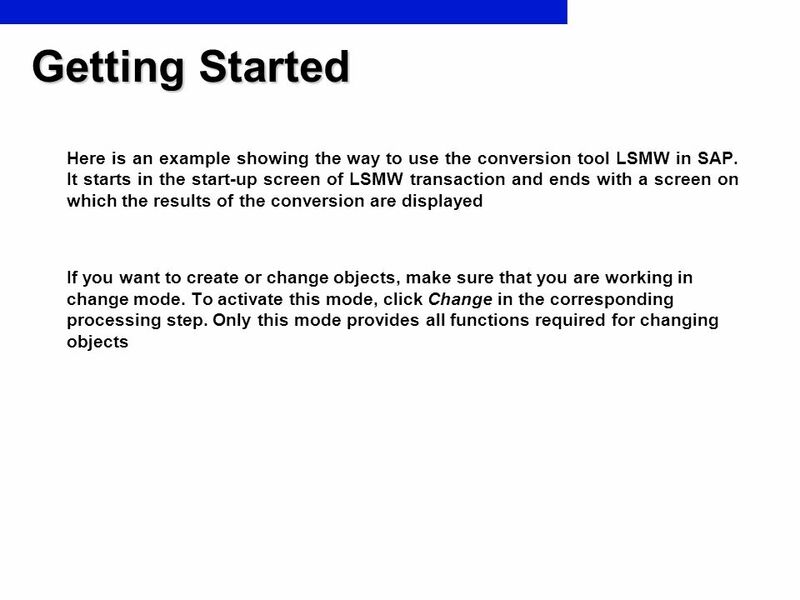 File for Converted data: Here, the file name is entered with file extension ’.lsmw.conv’. This file will contain all your converted data after applying the conversion rules if any. 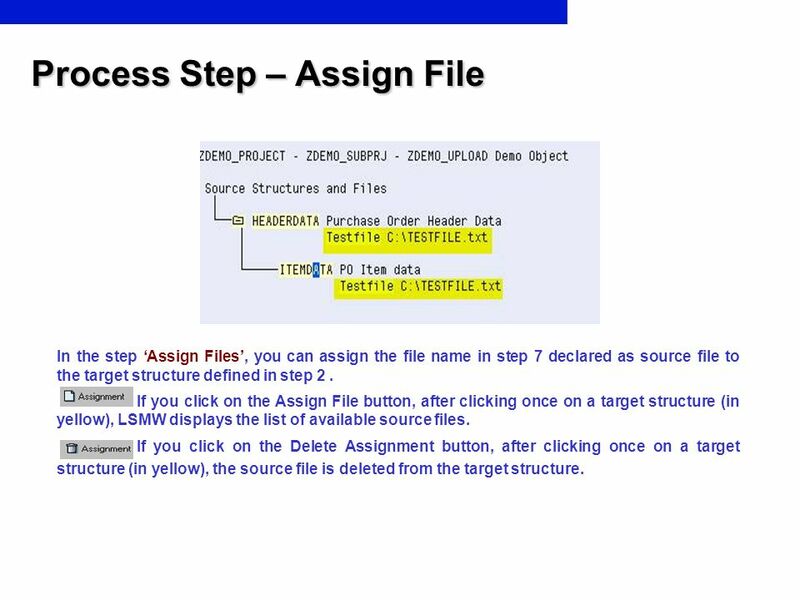 In the step ‘Assign Files’, you can assign the file name in step 7 declared as source file to the target structure defined in step 2 . 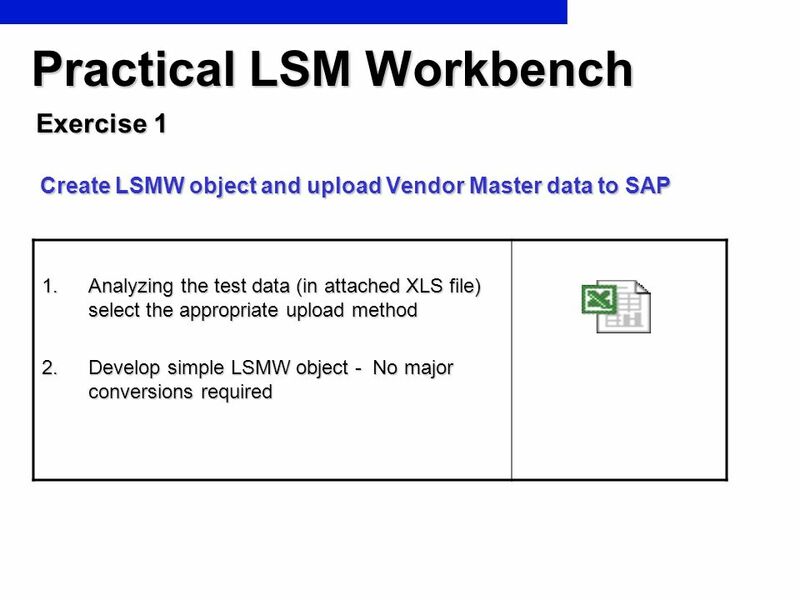 If you click on the Assign File button, after clicking once on a target structure (in yellow), LSMW displays the list of available source files. 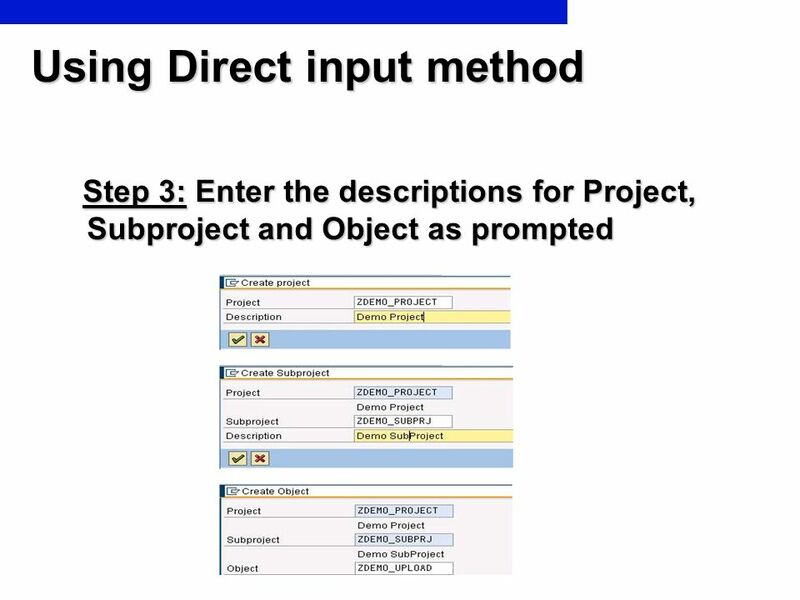 If you click on the Delete Assignment button, after clicking once on a target structure (in yellow), the source file is deleted from the target structure. In the step ’Read Data’, the file specified in previous step is, as linked to the target structures in . 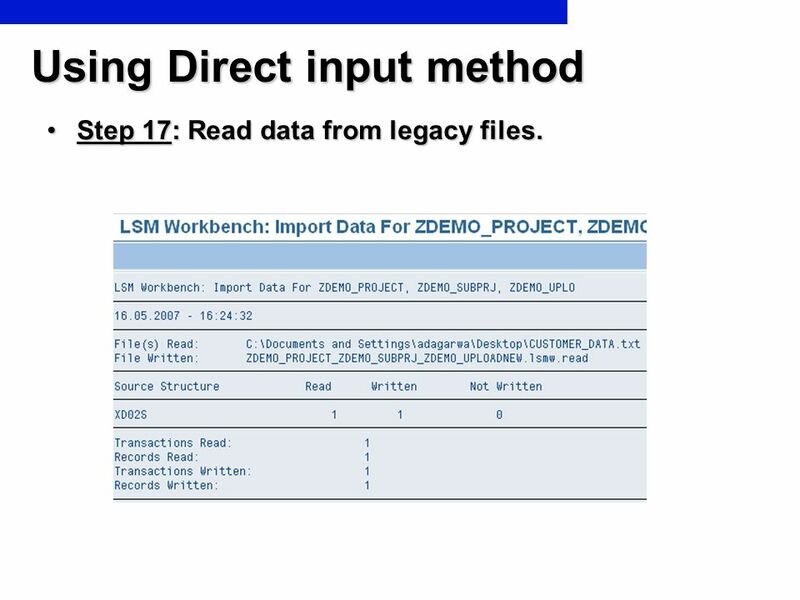 Even though you can select a range of transaction numbers, the whole file is being read, only the amount of transactions written is influenced. 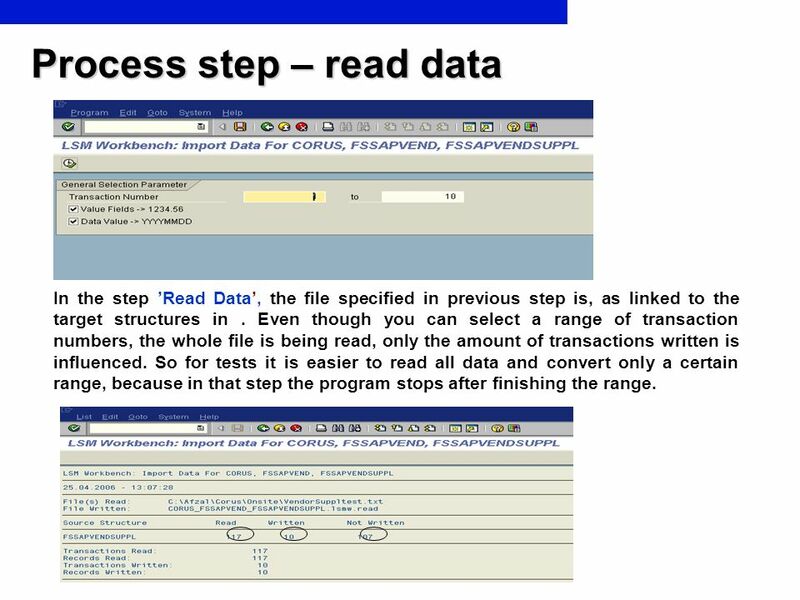 So for tests it is easier to read all data and convert only a certain range, because in that step the program stops after finishing the range. 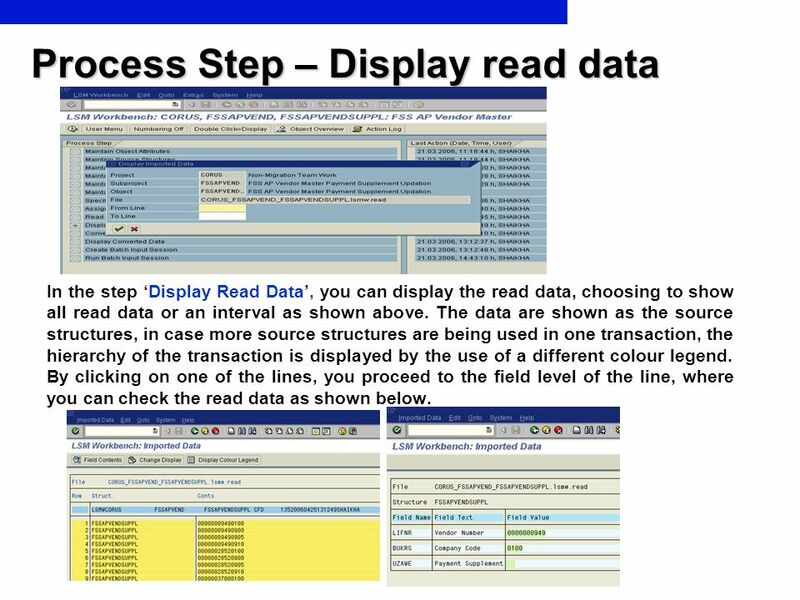 In the step ‘Display Read Data’, you can display the read data, choosing to show all read data or an interval as shown above. 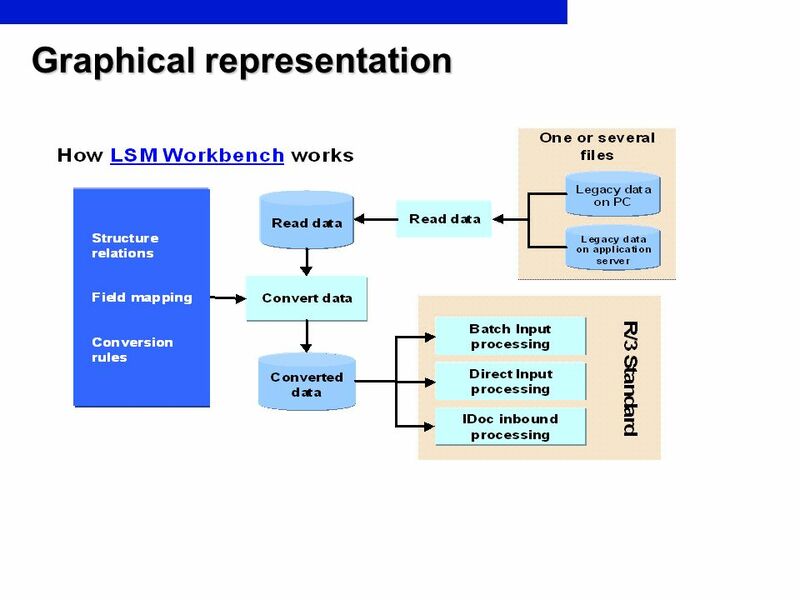 The data are shown as the source structures, in case more source structures are being used in one transaction, the hierarchy of the transaction is displayed by the use of a different colour legend. 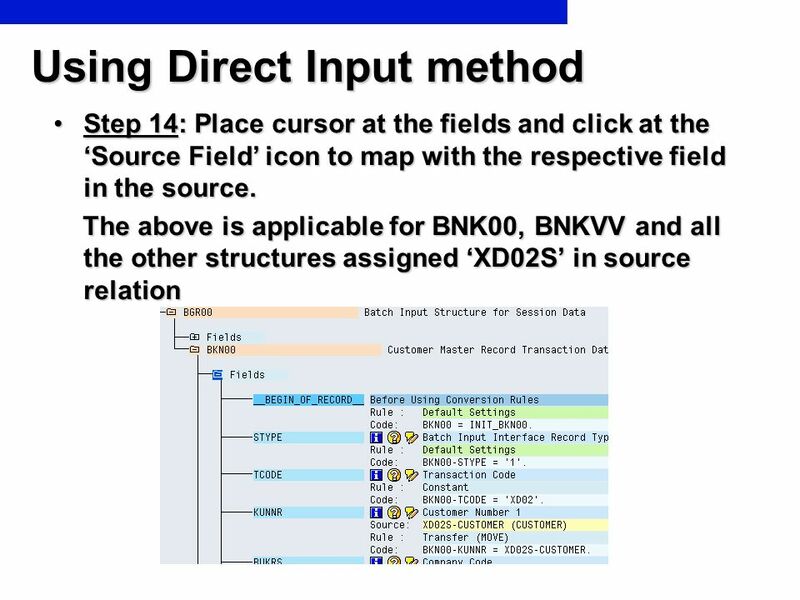 By clicking on one of the lines, you proceed to the field level of the line, where you can check the read data as shown below. 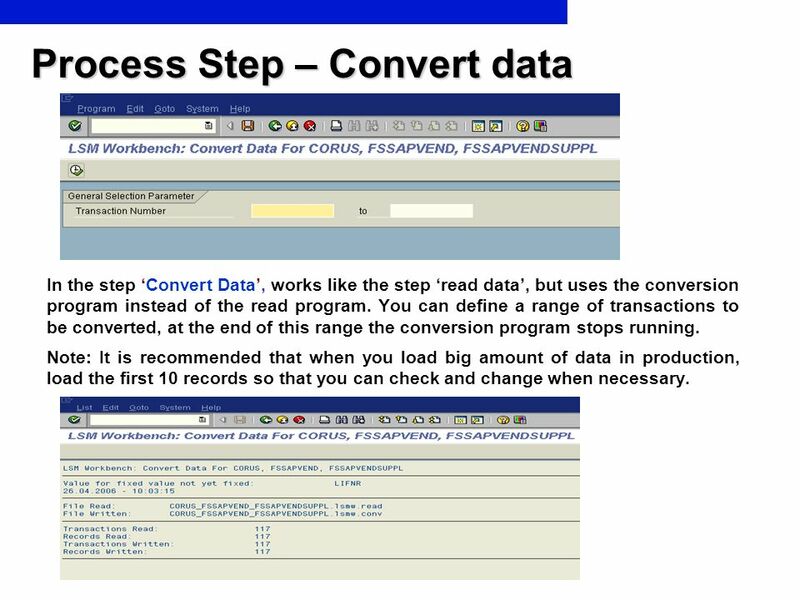 In the step ‘Convert Data’, works like the step ‘read data’, but uses the conversion program instead of the read program. 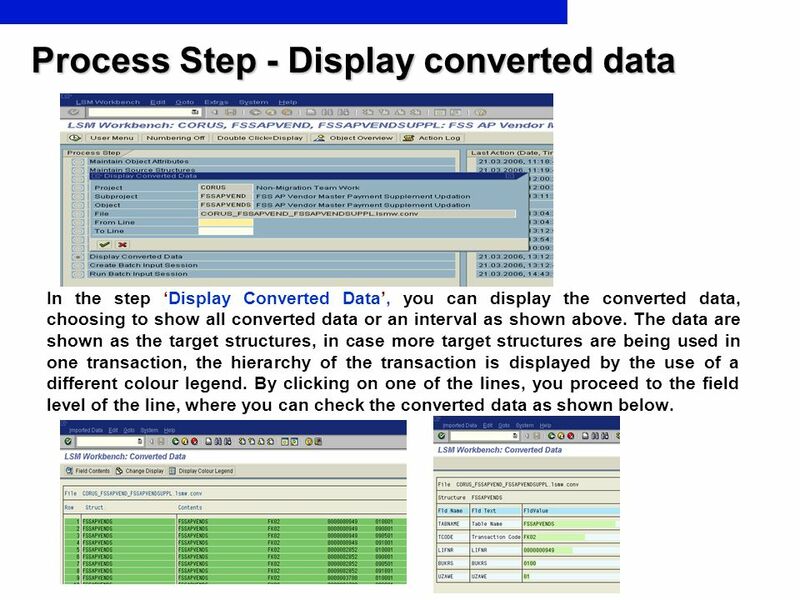 You can define a range of transactions to be converted, at the end of this range the conversion program stops running. Note: It is recommended that when you load big amount of data in production, load the first 10 records so that you can check and change when necessary. 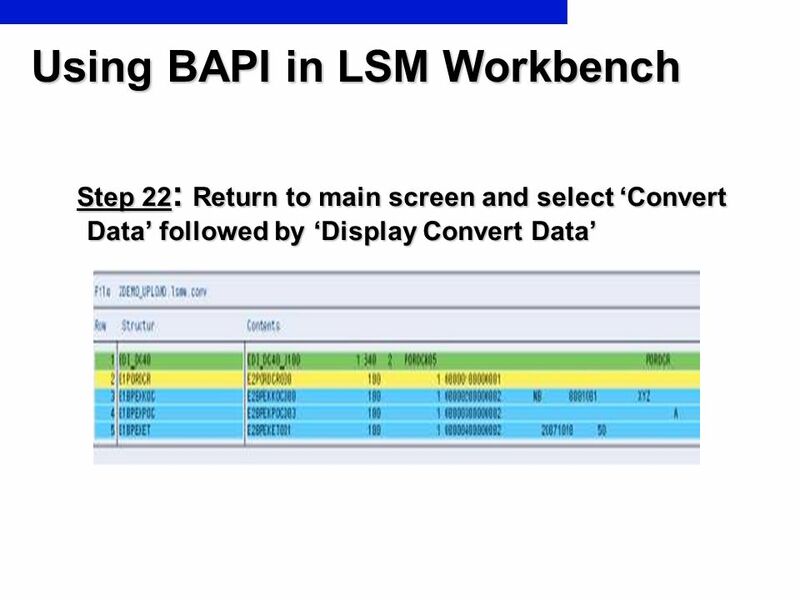 In the step ‘Display Converted Data’, you can display the converted data, choosing to show all converted data or an interval as shown above. 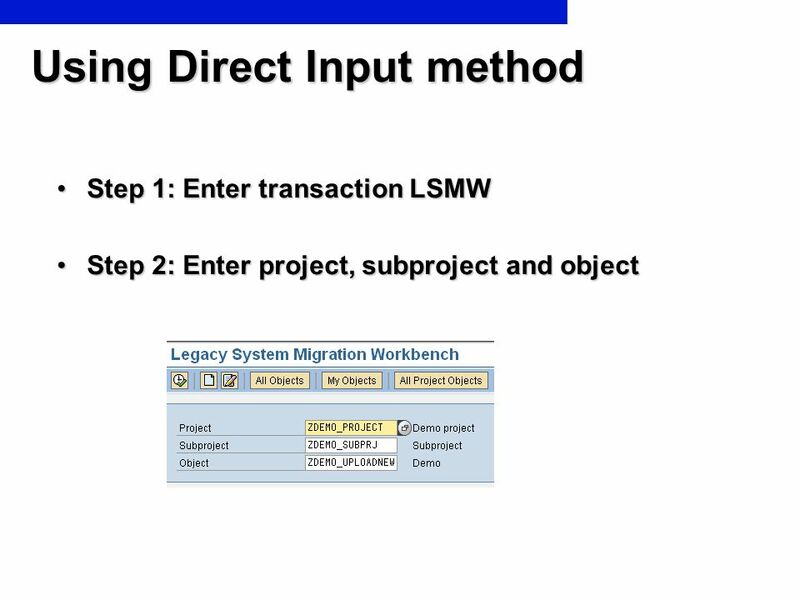 The data are shown as the target structures, in case more target structures are being used in one transaction, the hierarchy of the transaction is displayed by the use of a different colour legend. 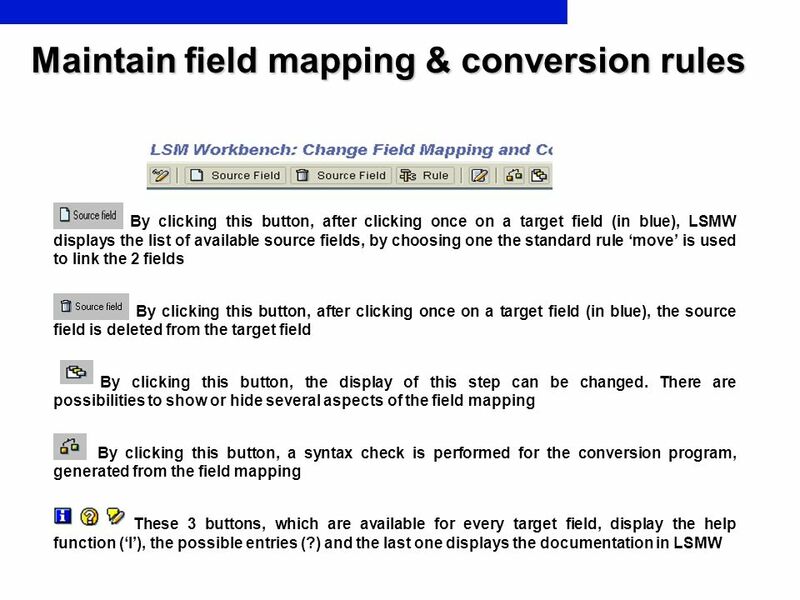 By clicking on one of the lines, you proceed to the field level of the line, where you can check the converted data as shown below. 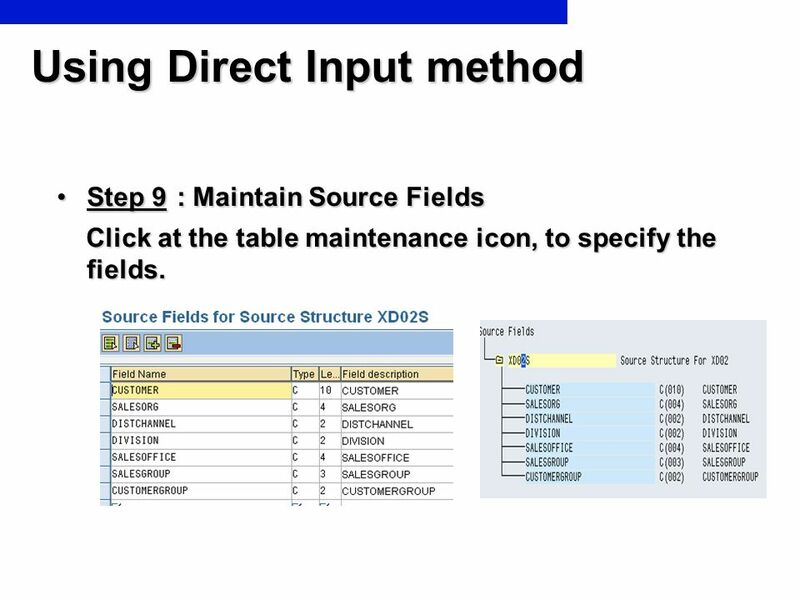 Step 9 : Maintain Source Fields Click at the table maintenance icon, to specify the fields. 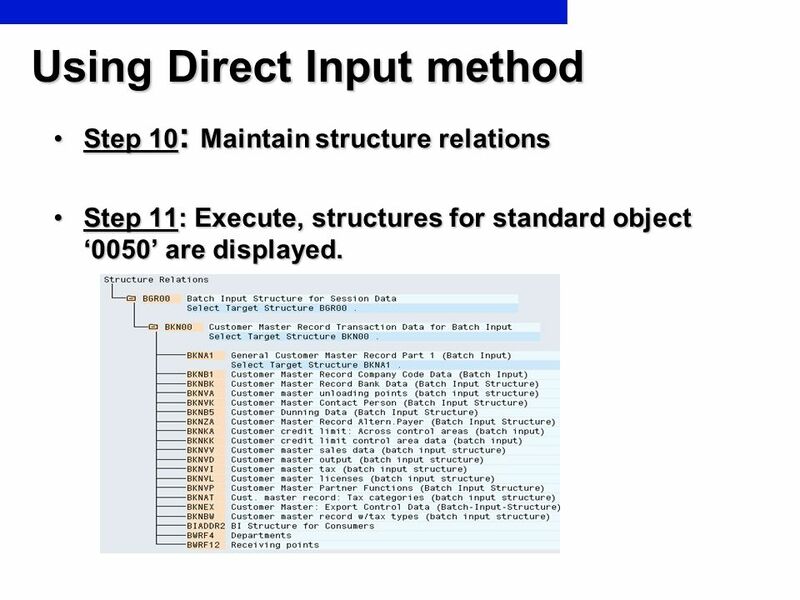 Step 10: Maintain structure relations Step 11: Execute, structures for standard object ‘0050’ are displayed. 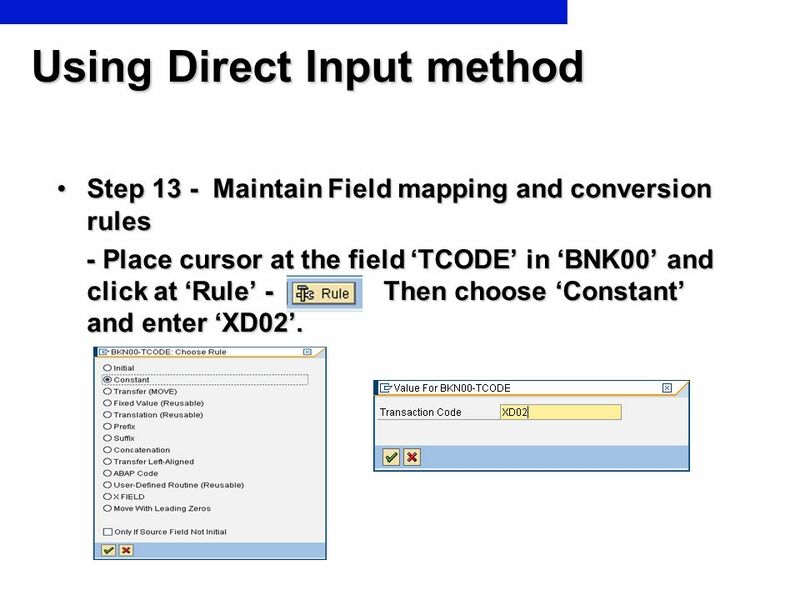 Step Maintain Field mapping and conversion rules - Place cursor at the field ‘TCODE’ in ‘BNK00’ and click at ‘Rule’ Then choose ‘Constant’ and enter ‘XD02’. 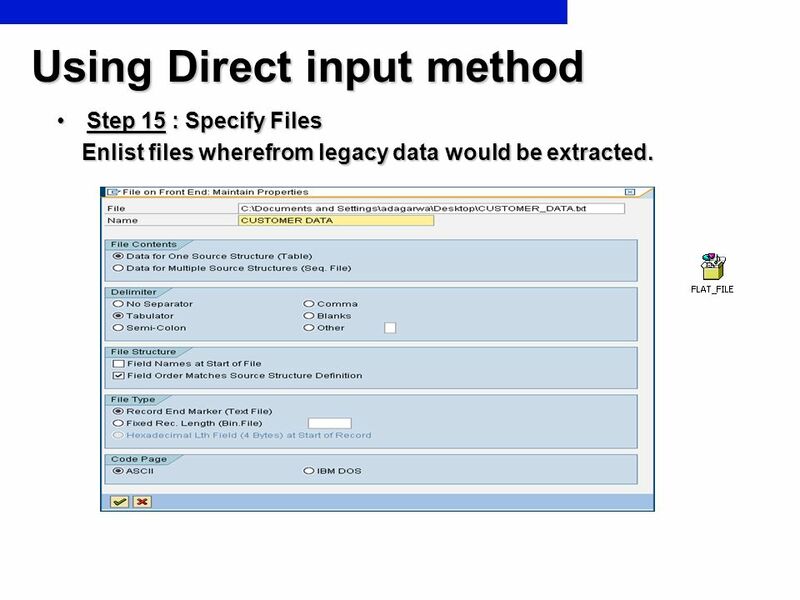 Step 15 : Specify Files Enlist files wherefrom legacy data would be extracted. 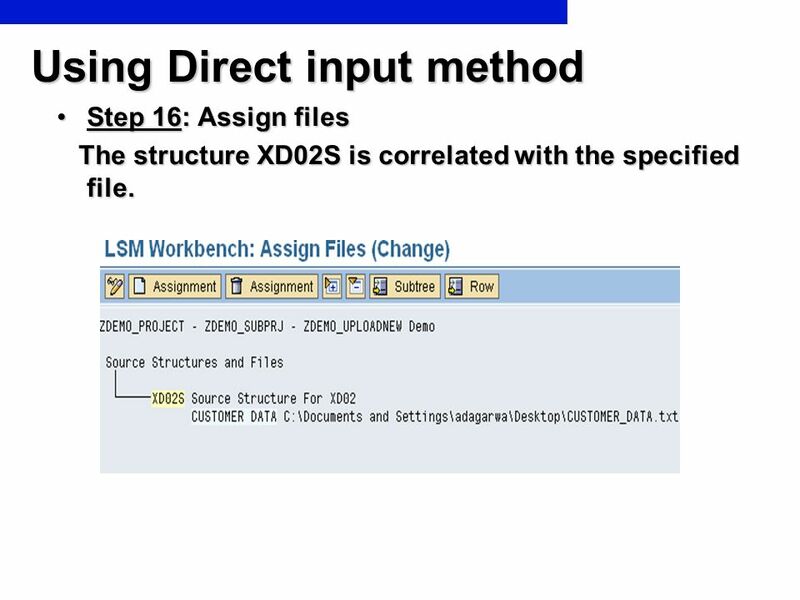 Step 16: Assign files The structure XD02S is correlated with the specified file. 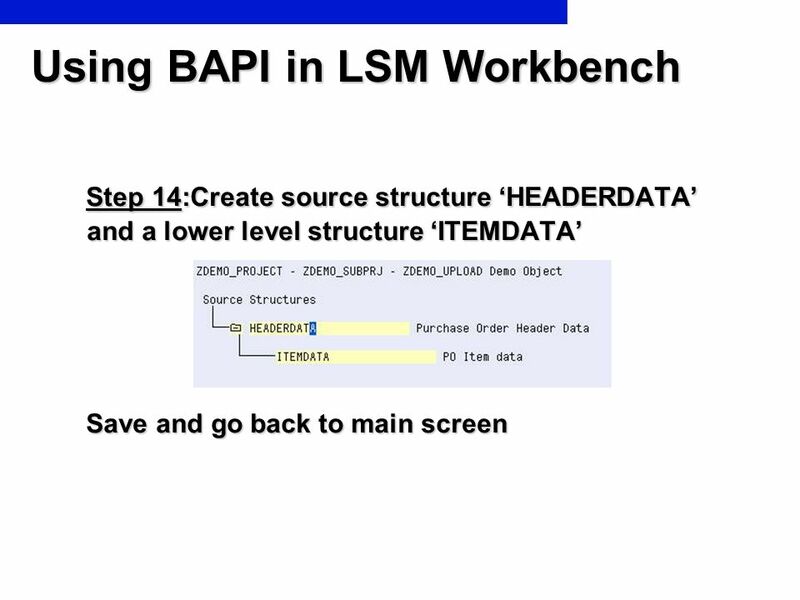 Step 17: Read data from legacy files. 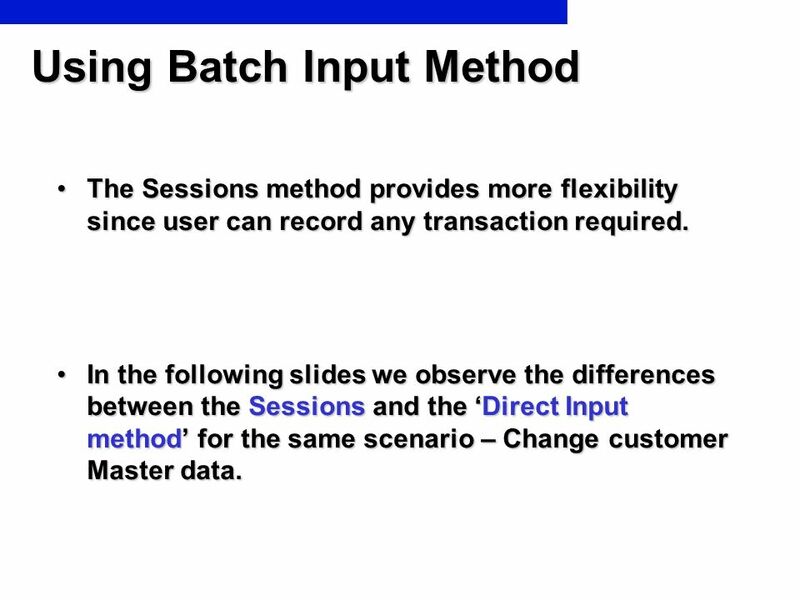 The Sessions method provides more flexibility since user can record any transaction required. 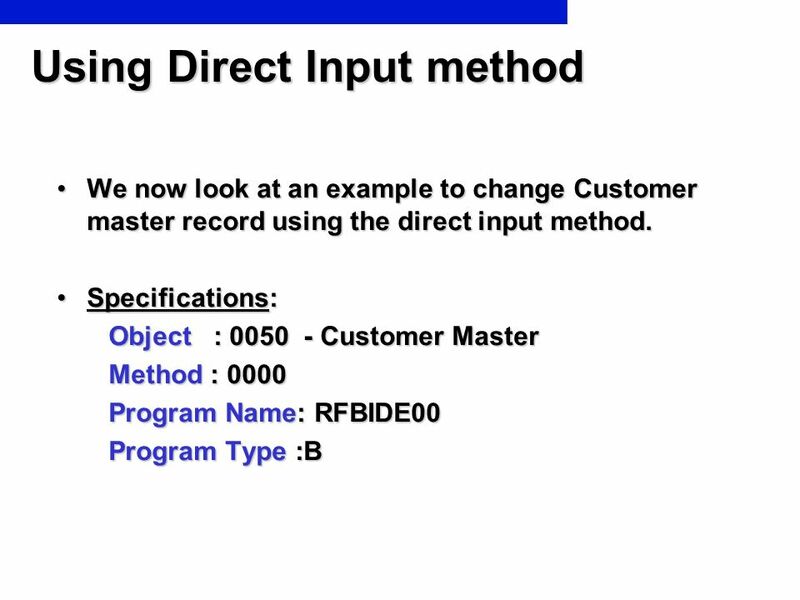 In the following slides we observe the differences between the Sessions and the ‘Direct Input method’ for the same scenario – Change customer Master data. 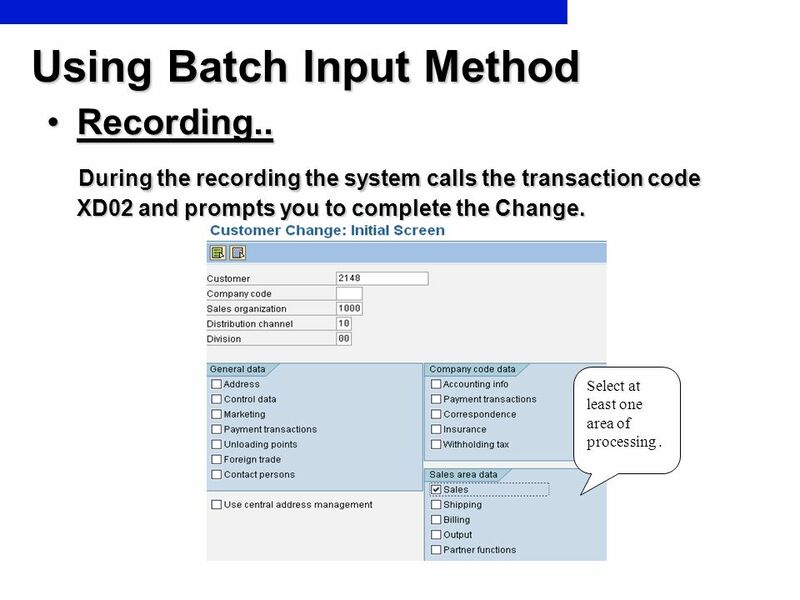 Recording.. During the recording the system calls the transaction code XD02 and prompts you to complete the Change. Select at least one area of processing . 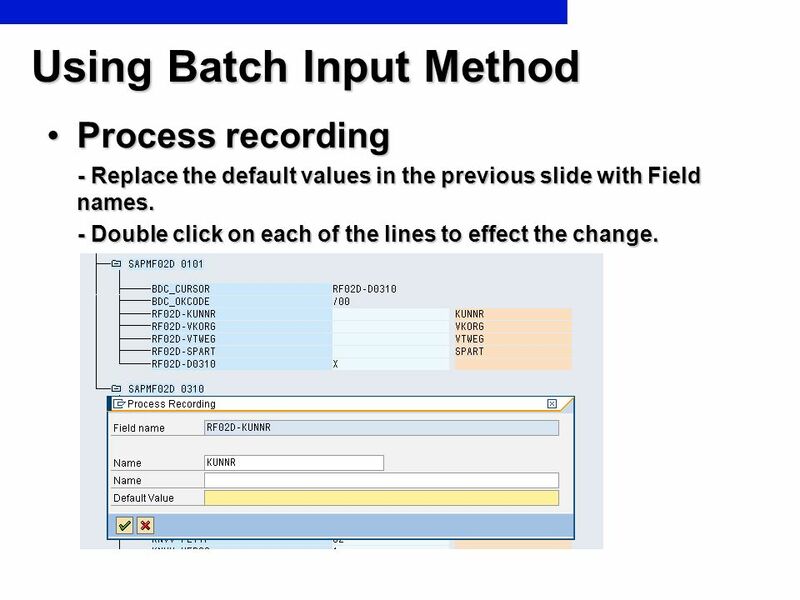 Process recording - Replace the default values in the previous slide with Field names. - Double click on each of the lines to effect the change. 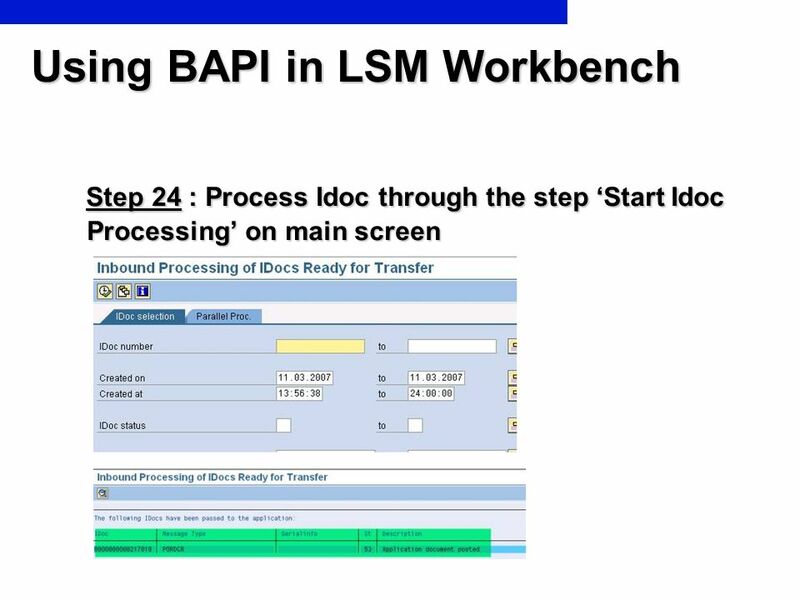 Step 5 :“IDoc Inbound Processing” screen appears. 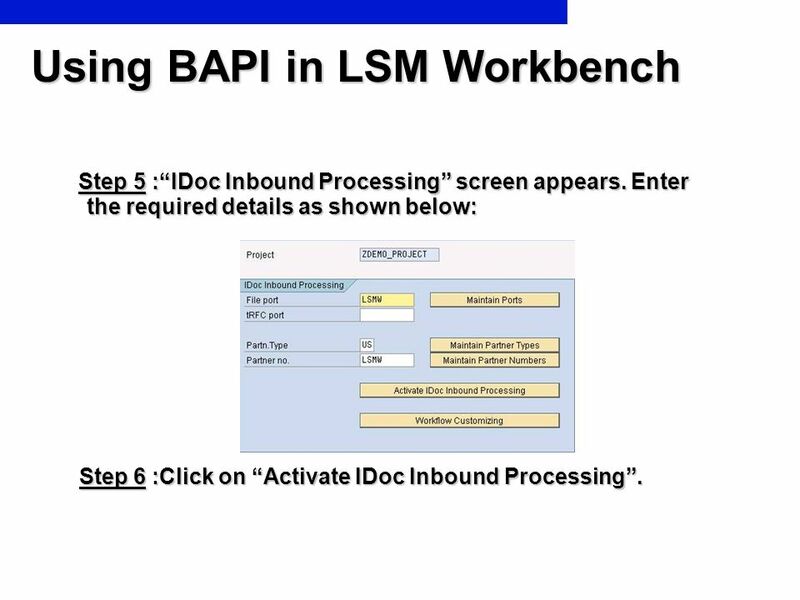 Enter the required details as shown below: Step 6 :Click on “Activate IDoc Inbound Processing”. 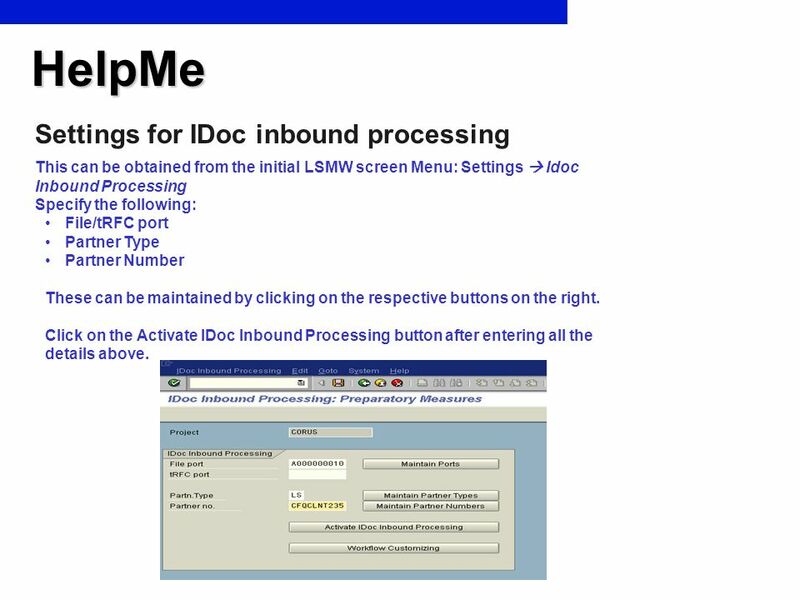 This can be obtained from the initial LSMW screen Menu: Settings  Idoc Inbound Processing Specify the following: File/tRFC port Partner Type Partner Number These can be maintained by clicking on the respective buttons on the right. Click on the Activate IDoc Inbound Processing button after entering all the details above. 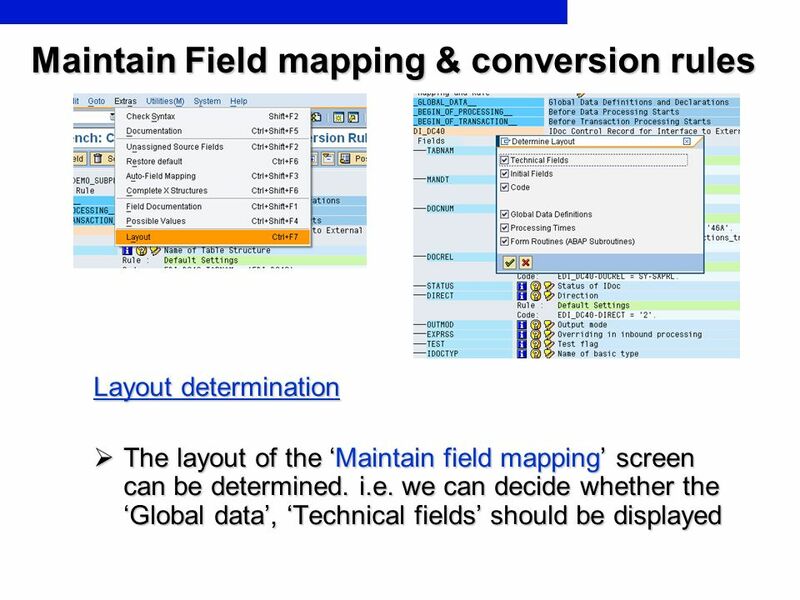 Fields cannot be seen in the field mapping after a recording has been created. 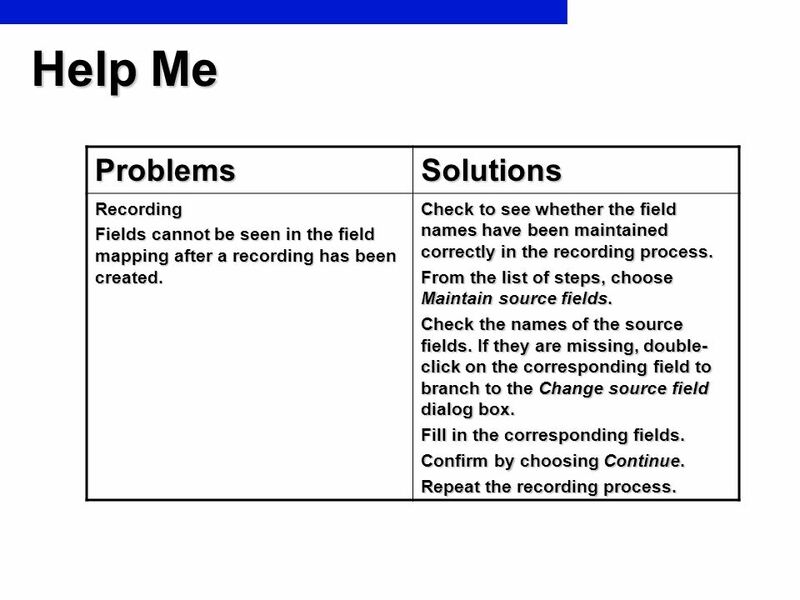 Check to see whether the field names have been maintained correctly in the recording process. From the list of steps, choose Maintain source fields. 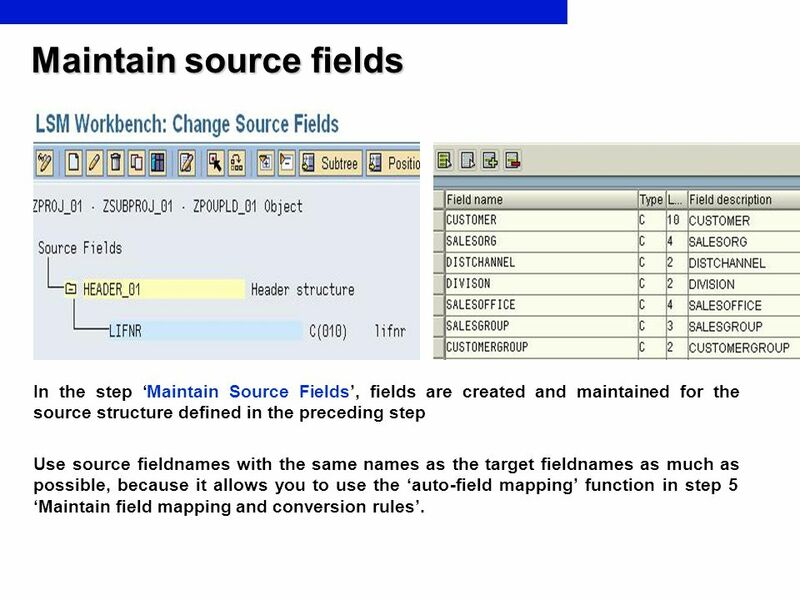 Check the names of the source fields. If they are missing, double-click on the corresponding field to branch to the Change source field dialog box. Fill in the corresponding fields. Confirm by choosing Continue. Repeat the recording process. 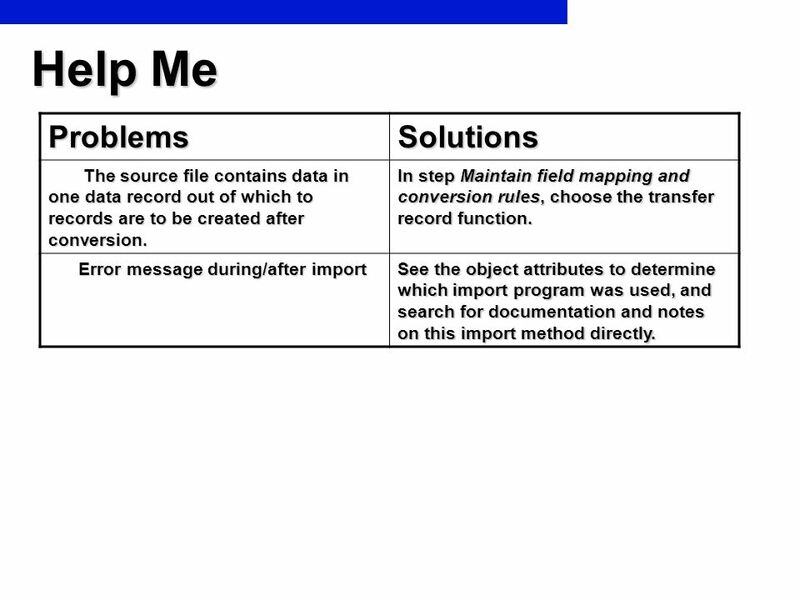 The source file contains data in one data record out of which to records are to be created after conversion. 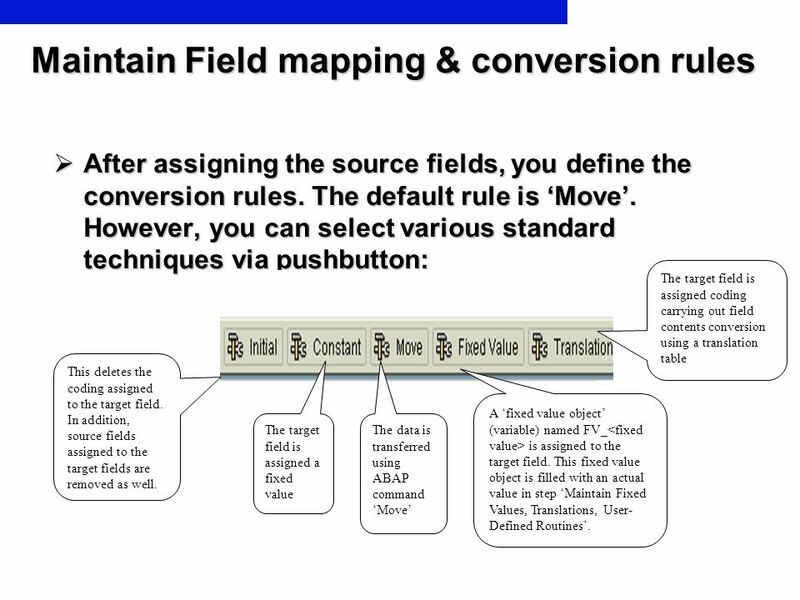 In step Maintain field mapping and conversion rules, choose the transfer record function. Error message during/after import See the object attributes to determine which import program was used, and search for documentation and notes on this import method directly. 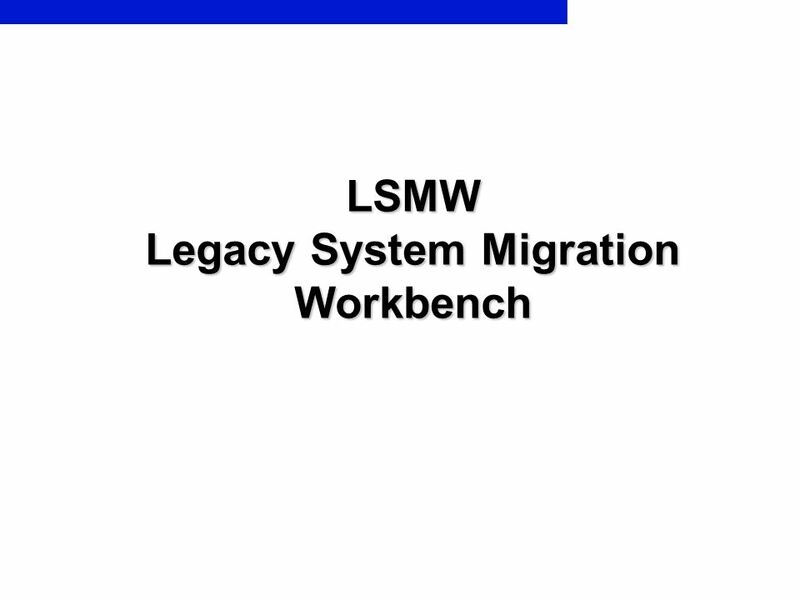 Download ppt "LSMW Legacy System Migration Workbench"
School of Geography FACULTY OF ENVIRONMENT Working with Tables 1. © Paradigm Publishing, Inc Access 2010 Level 1 Unit 1Creating Tables and Queries Chapter 2Creating Relationships between Tables. Access Tables 1. Creating a Table Design View Define each field and its properties Data Sheet View Essentially spreadsheet Enter fields You must go to.